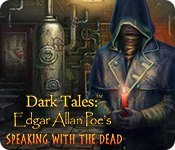 June 30th, 2011 by Big Fish Games in Walkthroughs. 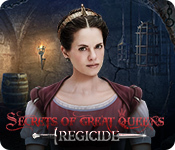 Welcome to the Intrigue Inc.: Raven’s Flight Walkthrough! 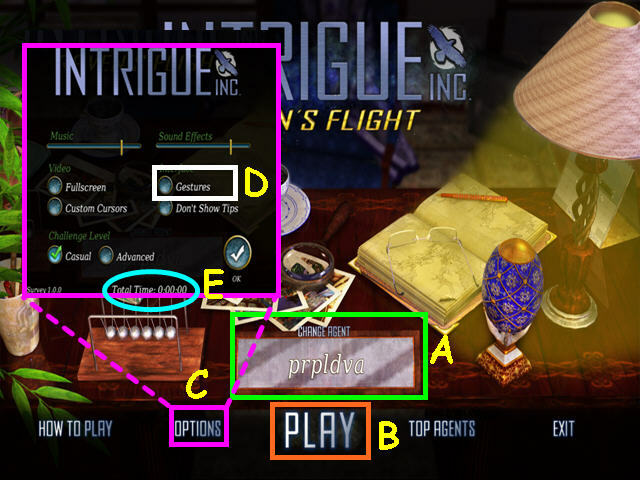 This document contains a complete Intrigue Inc.: Raven’s Flight game walkthrough featuring annotated screenshots from actual gameplay! Select ‘Change Agent’ on the main screen to add or delete player profiles (A). 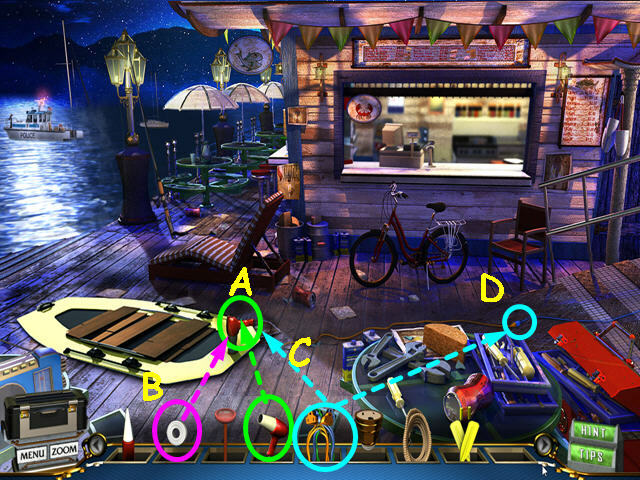 Select ‘Play’ to begin or continue your game (B). 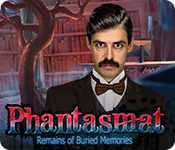 You may play this game in full screen or windowed mode by changing the settings in the Options menu (C). 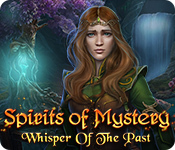 You may adjust the volume of sound effects and music in the Options menu. You can change the level of difficulty to Casual or Advanced. 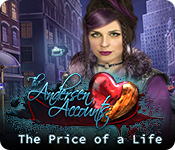 You can change difficulty levels at any time during the game. 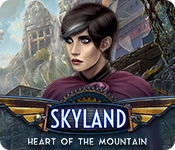 The Casual level has lots of helpful sparkles, faster hint and skip recharges. The gestures are off by default. The Advanced level has no sparkles, slower hint and skip recharges. The gestures are on by default. Gestures on will require you to manually move an item in the needed direction as opposed to just clicking an inventory item on an object (D). Your total game play time is located at the bottom of the options menu (E). 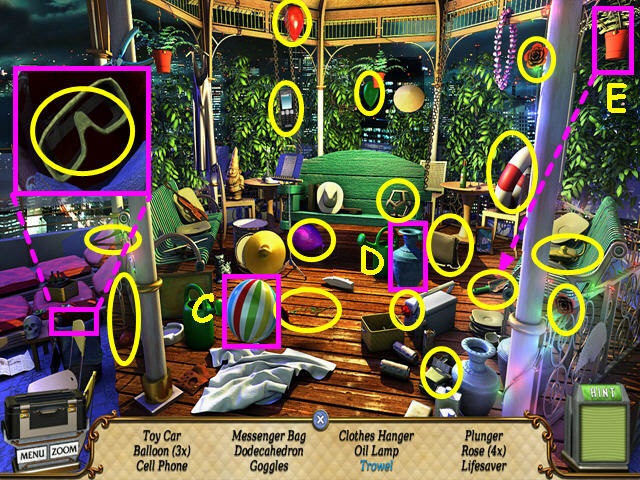 The Hidden Object Scenes and many of the mini-games in this game are randomized – your solutions may vary. The menu button in the lower left will give you access the settings menu or return to the main menu (F). Right-click or select zoom for a magnifier (G). 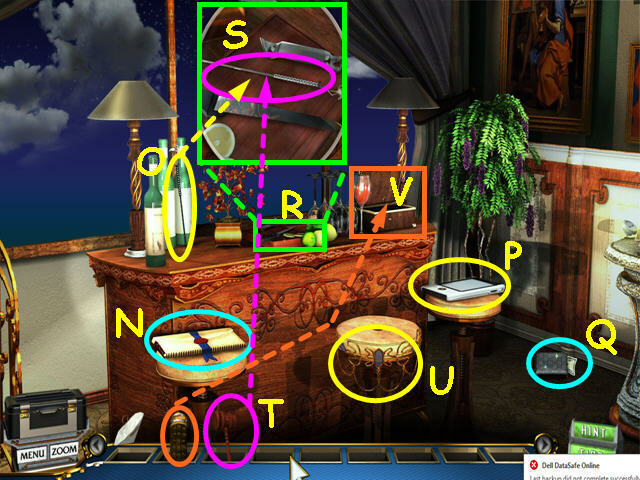 Above the menu button is the collection case – gather all the Objects of Interest here (H). Your inventory is in the bottom panel – click on an item to select it for use (I). Use the scroll buttons at each end to view more inventories. 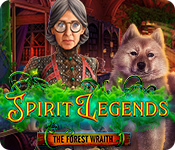 Hints are unlimited, but you must wait for the button to refill (J). 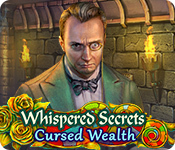 Tips are also available and will give a clue to what you must do next. The use of a tip or hint will add 60 seconds to your overall total time. 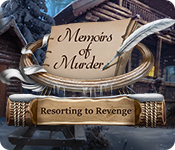 After the story introduction, click on the screen to continue. 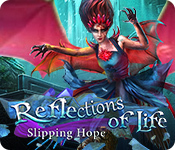 Click on the dossier to have it self-destruct. You have the option of a brief tutorial. Look in the garbage can (B). Use the BOOT on the piggy bank (C). Drag the BOOT from the top of the garbage can to the piggy bank if you are using gestures. 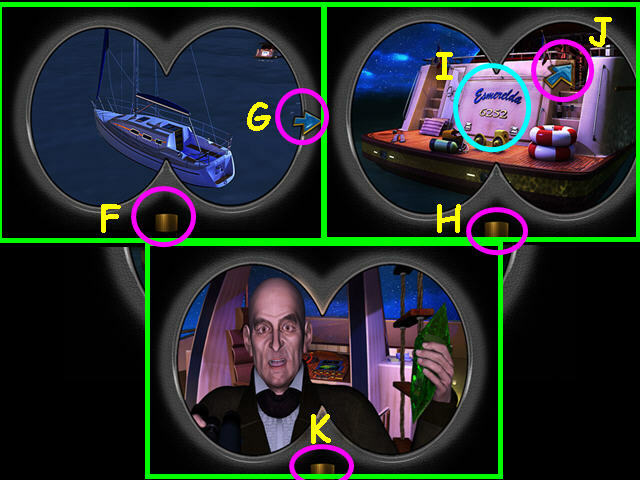 Use the COIN on the binoculars (E). Click on the focus button (F). Turn to the right (G). Click on the focus button (H). Note the number under the name of the yacht (I). Move up and to the right (J). Click on the focus button (K). Look at the close-up of the gate lock (L). 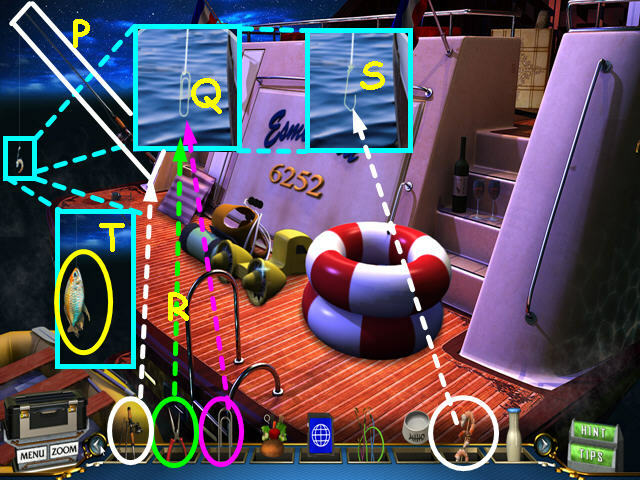 Enter the number from the stern of the yacht: 6-2-5-2 (M). Click on each number to change it to match. 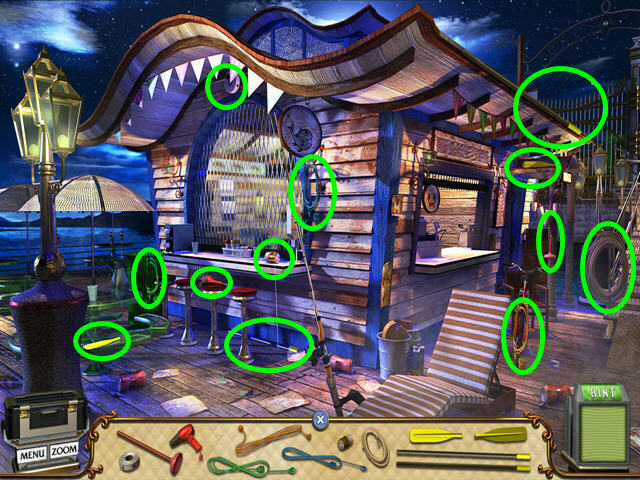 Click on the fishing pole (O). Use the SK-80 on the window (Q). Drag the SK-80 from the lower left corner up, drag from the upper left corner to the upper right corner, and then continue down to the lower right corner of the window if you are using gestures. 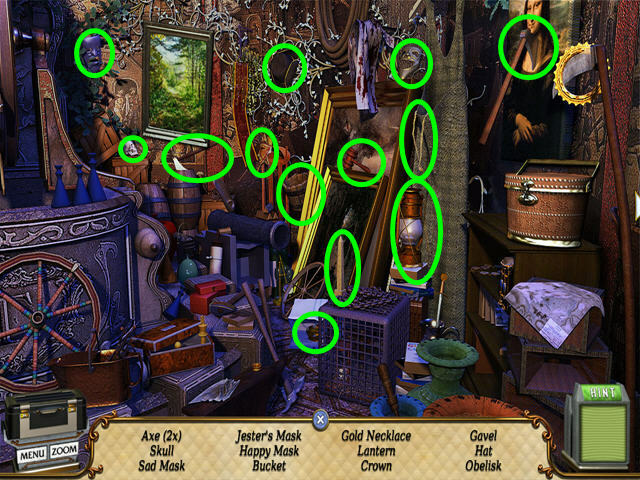 Select the window for a Hidden Object Scene (R). 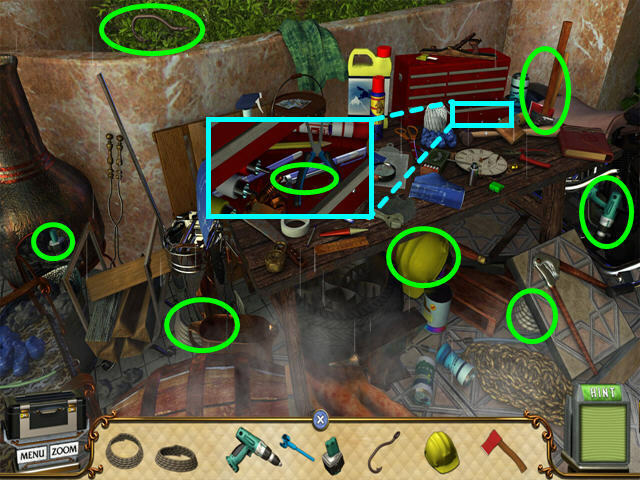 Some items are hidden and require you to move or open another item. Use the key to open the locker (S). Move the basket to the side (T). Look at the close-up of the drink machine (U). Take a cup and use it on the dispenser (V). You will earn the DEFLATED RAFT. Place the DEFLATED RAFT on the pier (W). 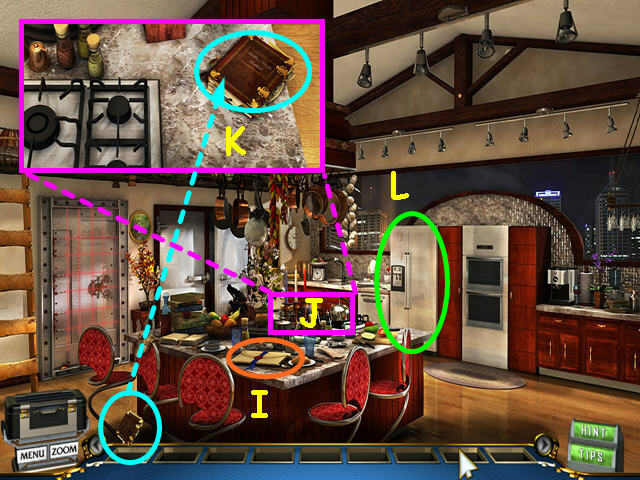 Select the tables for a Hidden Object Scene (X). You will earn the DUCT TAPE, PLUNGER, HAIR DRYER, CORDS, ADAPTER, ROPE, and OARS. Place the HAIR DRYER at the end of the boat (A). Use the DUCT TAPE on the hair dryer (B). Use a CORD on the hair dryer (C). Connect a second CORD to the first (D). Use the ROPE on the lamp pole (E). Drag the ROPE from the top of the lamp pole down to the ground if you are using gestures. Use the ADAPTER on the lamp socket (F). Use the 3rd CORD on the adapter (G). Walk forward to the pier. Click on the hair dryer to blow up the boat (H). Use the PLUNGER on the hair dryer (I). Use the GLUE on the plunger (J). When using gestures, drag the GLUE from the top center to the bottom in a semi-circle on the right. Continue from the bottom to the top with a semi-circle on the left. Place the OARS in the boat (K). Move the 4 items to the side (A). 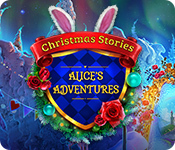 Take the Object of Interest – Ornamental Hare (B). 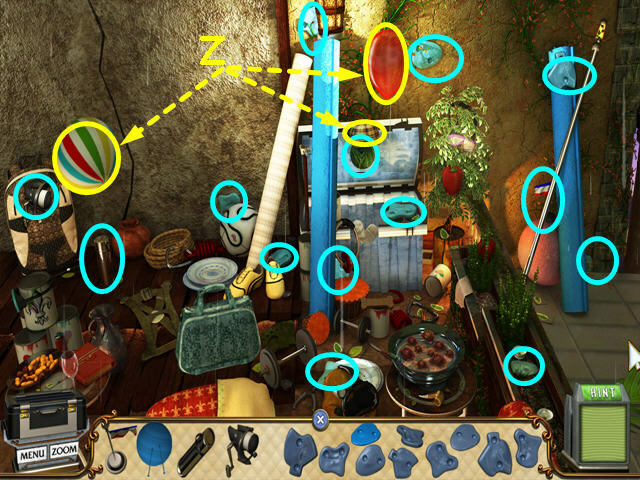 Look in the cargo hold for a Hidden Object Scene (C). Move the left green boot (D). You will earn the Object of Interest – Golden Elephant. You will also earn 1 of 5 DIAGRAM and a FISHING POLE. Move the ewer to find the Object of Interest – Aphrodite’s Hair Clip (F). Move the cushion to find the NEEDLE-NOSE PLIERS (G). 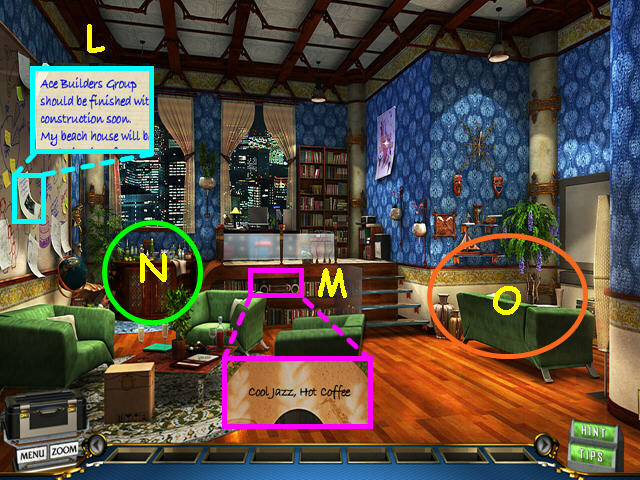 Look at the coffee table and take the PAPER CLIP (H). 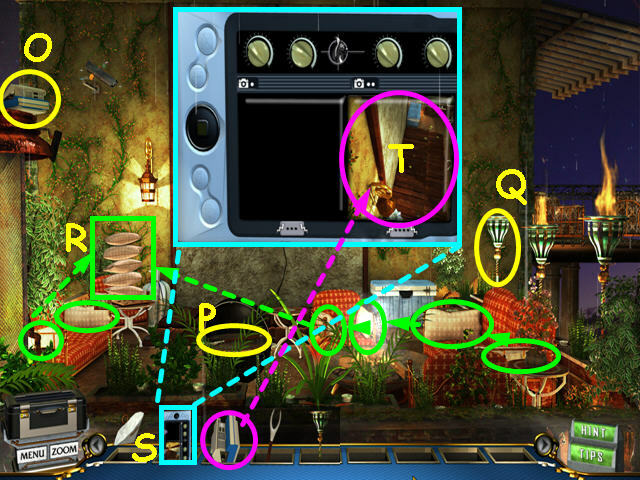 Select the grill area for a Hidden Object Scene (J). Open the mini-fridge door (K). Open the oven door (L). Take the Object of Interest – Silver cat (M). 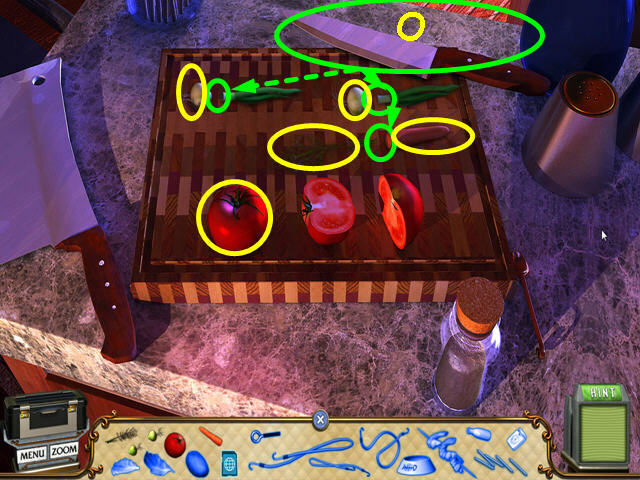 Select the cutting board for the final 5 items (N). Use the knife to cut the 2 onions and the carrot (O). You will earn the VEGGIES, GPS CHIP, BUNGEE, CAT BOWL, SHRIMP SKEWER, MILK BOTTLE, and FLOSS. Walk down to return to the rear of the yacht. Place the FISHING POLE into the holder (P). 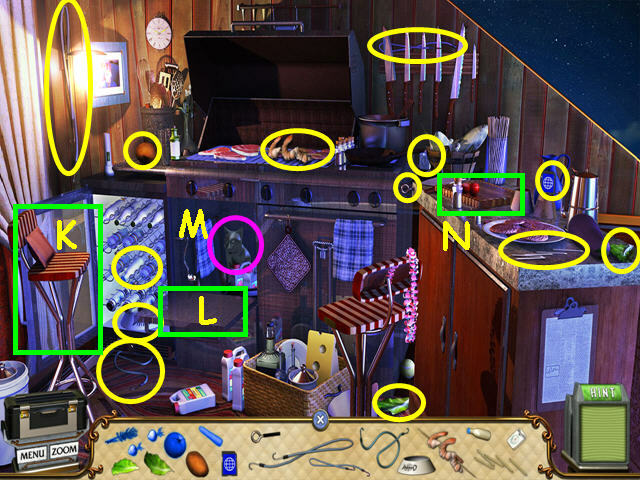 Look at the fishing line and place the PAPER CLIP at the end (Q). Use the NEEDLE-NOSE PLIERS on the paper clip to make it a hook (R). Place the SHRIMP SKEWER on the hook (S). After you place the SHRIMP SKEWER on the hook, you will need to drag the FISH up the fishing line if you are using gestures. Take the FISH that is caught (T). Note the area by the security scanner (U). Note the retracted ladder (V). Look at the close-up of the coffee table (W). 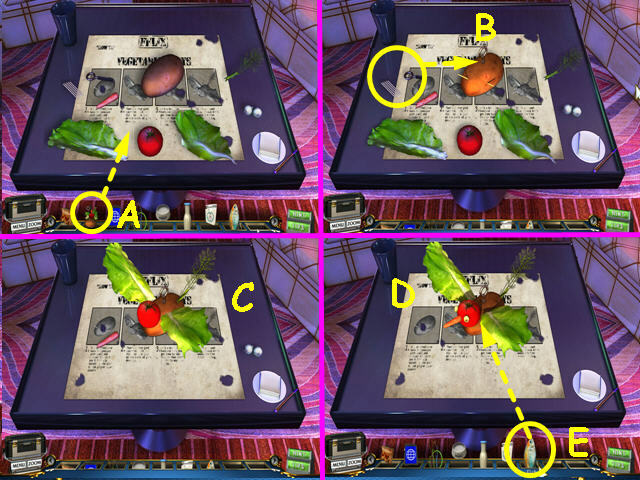 Place the VEGGIES on the table (A). Place the toothpicks and the eye ring screw into the potato (B). Place the tomato as the head, the carrot greens as the tail and the 2 lettuce leaves as the wings (C). Place the carrot as the nose and the onions as eyes (D). Use the FISH on the veggie bird to make it smell appetizing to a cat (E). 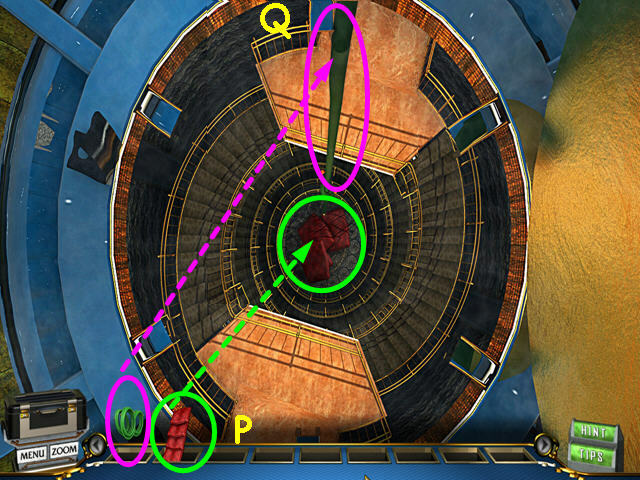 Players using gestures will need to drag the fish from left to right, then from right to left. 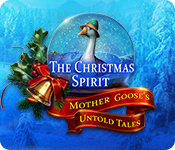 The TOY BIRD will go automatically into your inventory. Look at the close-up of the security scanner on the left (F). Place the CAT BOWL on the floor (G). Use the MILK BOTTLE on the cat bowl (H). Use the FLOSS on the scanner (I). Use the TOY BIRD on the scanner (J). Climb up the ladder that appears. Take the 2 DECK CHAIRS (K). Move the guitar aside to find the Object of Interest- Golden Weasel (L). Note the side walkway to the front of the boat (M). 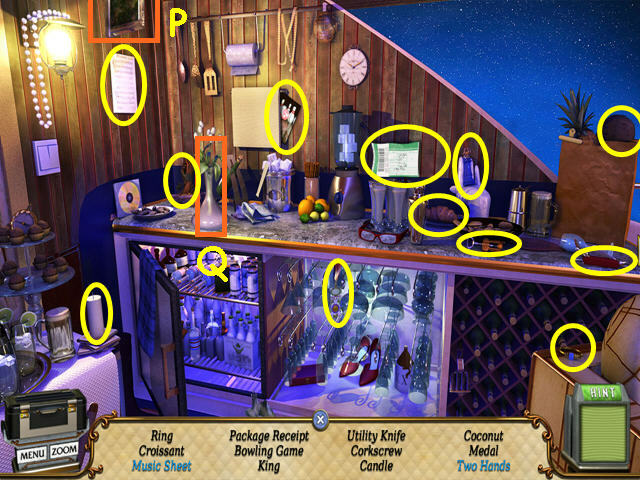 Select the bar area for a Hidden Object Scene (O). 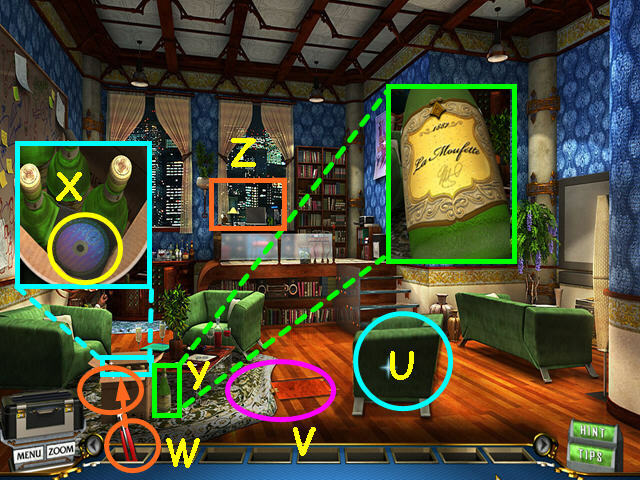 Move the picture to find the music sheet (P). Move the vase to find two hands (Q). You will earn the KING and the TWO HANDS. Walk forward on the side to the front of the boat. Take the DECK CHAIR (R). Note the security panel (T). Look at the close-up of the bread (V). Take the knife and use it on the bread (W). Gestures on will require you to drag the knife in a ‘M’ pattern. Take the Object of Interest- Major Moolah (X). Walk down to return to the previous scene. Stack the 3 DECK CHAIRS (A). 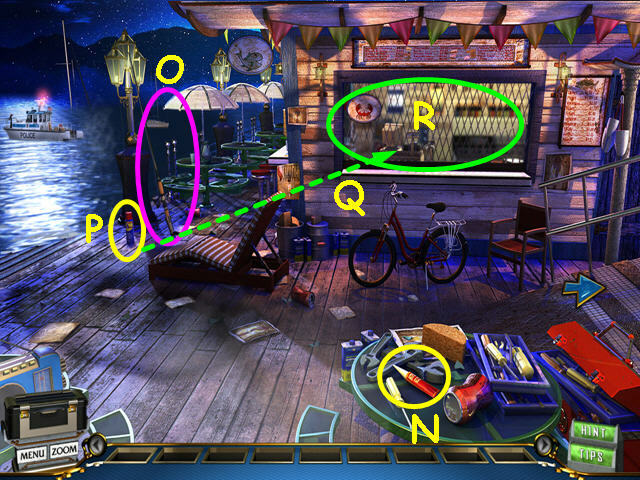 Use the BUNGEE CORDS on the stacked chairs (B). 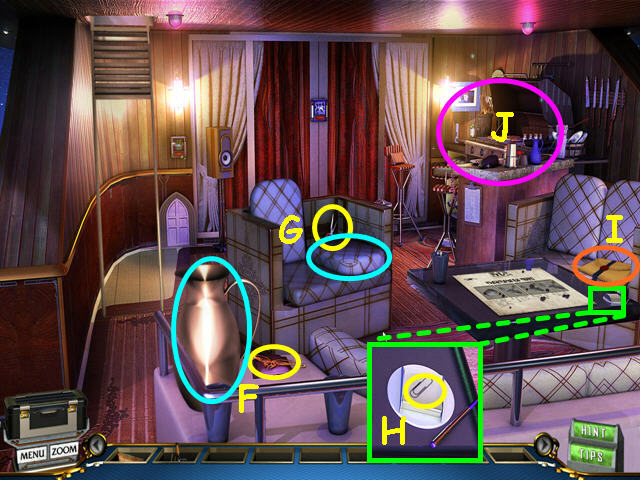 Note the game table (C). Climb up the stacked chairs. Move the dress to find the Object of Interest- Necklace of Raindrops (D). Look at the close-up of the helm (G). Exit the close-up, then walk down to the bar area. 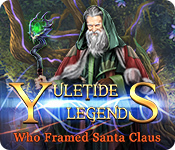 Place the 3 KINGS on the board according to the color of their crystal at the top of each piece- for example, the blue piece with the red crystal is the red king and belongs with the red set of pieces (I). Place the TWO HANDS in the center of the board (J). Drag the TWO HANDS down to push it into the center of the board if you are playing with gestures. 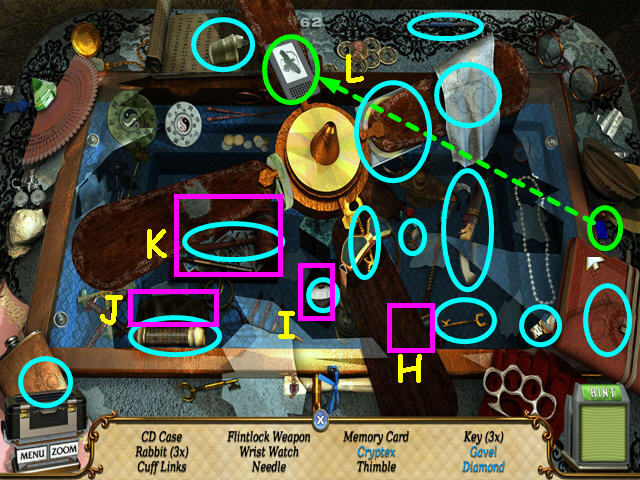 Take the CARTRIDGE and the 2 of 5 DIAGRAM from the hidden compartment (K). Walk forward on the side of the boat. Note the area with the life raft ahead (L). Take the BUTTER KNIFE from the table. 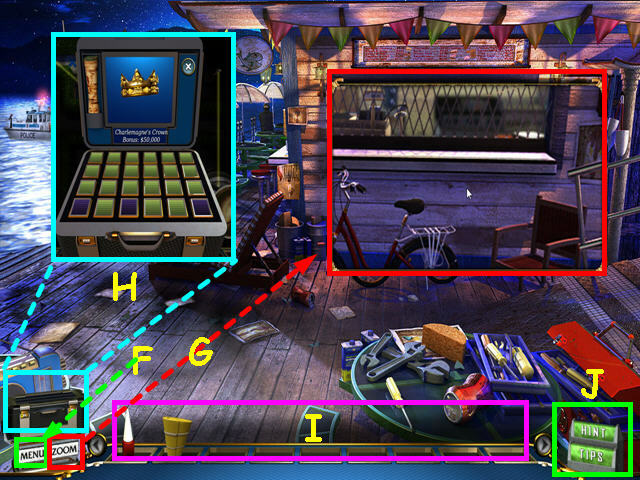 Place the CARTRIDGE on the panel for a mini-game (N). 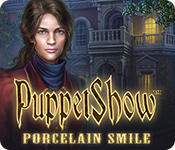 The object of this mini-game is to remove all the tiles. Click on sets of 2 or more like-colored tiles to remove them from the screen. The remaining tiles will move in the direction they are pointing if space appears. Click on the indicated tiles in numerical order (1-5). 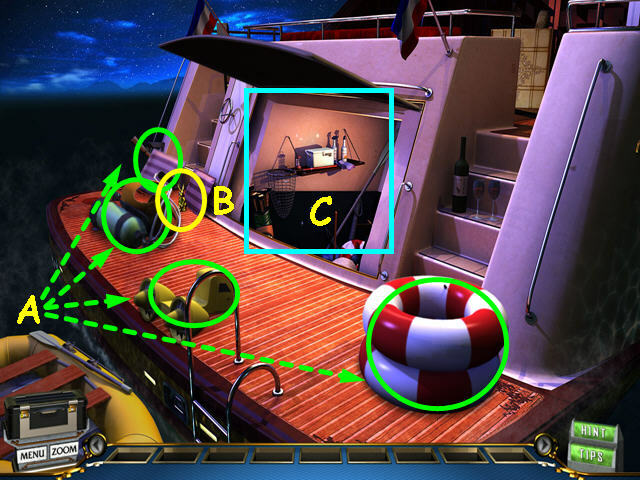 Select the life raft area for a Hidden Object Scene. Pick up the wrench and click on the red box (O). Use the wrench on the 2 bolts (P). Gestures users will need to drag the wrench in a circle counter-clockwise for each bolt. Open the door and take the GPS SCREEN. You will earn the TRANSISTORS and the GPS SCREEN. Walk down to exit the dining area, then climb up the tower of chairs. Look at the close-up of the helm. Place the GPS SCREEN at the top (Q). Use the BUTTER KNIFE on the 4 screws (R). Take the 3 of 5 DIAGRAM (S). Use the TRANSISTORS on the open box for a mini-game (T). 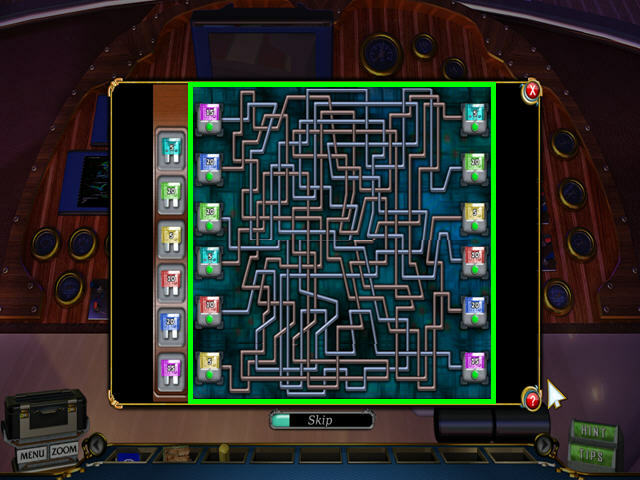 The object of this mini-game is to connect all the matching transistors. Follow the connection from one transistor to the other side and place the matching transistor into the open slot. Do this for all 6 transistors. Insert the GPS CHIP on the side of the screen (U). Turn on the 3 red buttons (V). Use the SCREWDRIVER in the ignition (W). Gestures users will need to first drag the SCREWDRIVER down to push it into the keyhole, then drag it in a circle clockwise to start the engines. Click on the throttle (X). Drag the throttle up if you are using gestures. Take the gold ball from the bushes and place it under the paw of the left lion (A). Read the security system diagram in the left lion’s mouth (B). 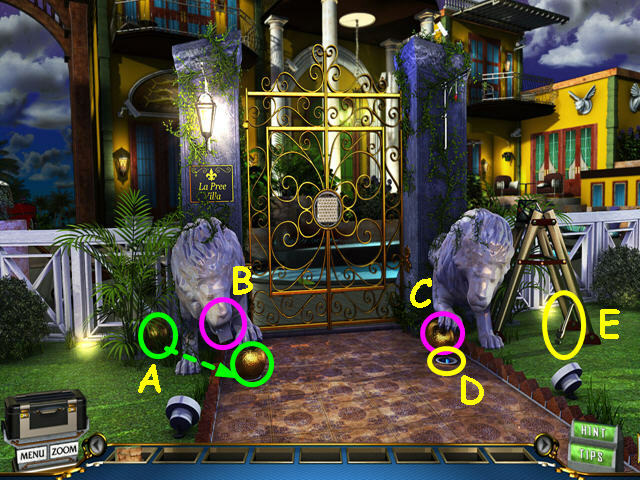 Click on the gold ball under the right lion’s paw to uncover a hole (C). Take the Object of Interest- Cobalt Pepper from the hole (D). Take the SWING HOOK (F). Look at the close-up of the fountain (I). 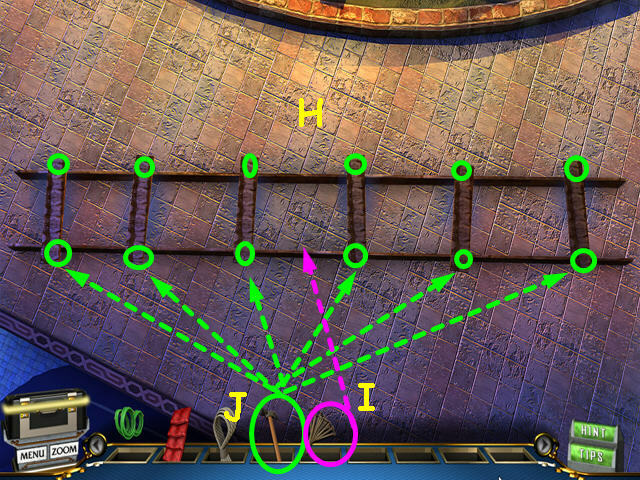 Use the WRENCH to take the Object of Interest- Jade Dolphin (J). You can try to walk forward here, but the laser bars will activate. 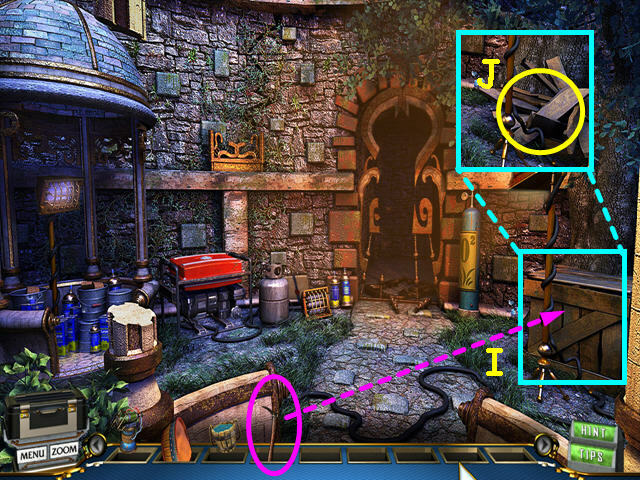 Select the bench area for a Hidden Object Scene (K). Look at the close-up of the box under the bench for some items (L). Move the dive tanks to find the Object of Interest- Charlemagne’s Crown (M). You will earn the 4 of 5 DIAGRAM, CRICKET BAT, and 2 of 4 WIRES. Walk to the left twice. Take the COPING SAW (N). Use the SWING HOOK on the upper right of the wood arch (O). 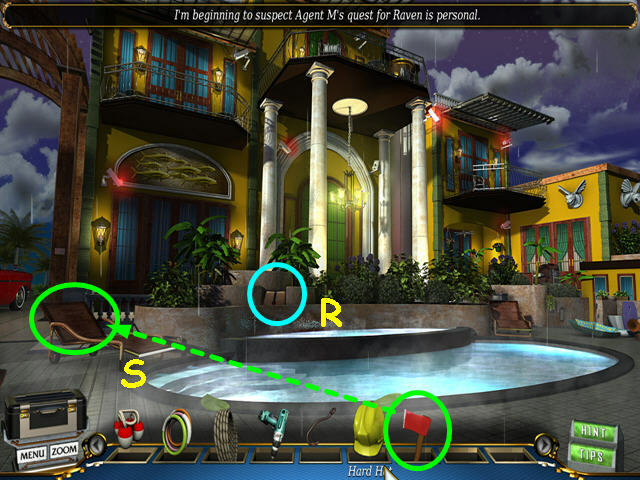 Players using gestures will have to drag the swing’s chain up to the chain hook. 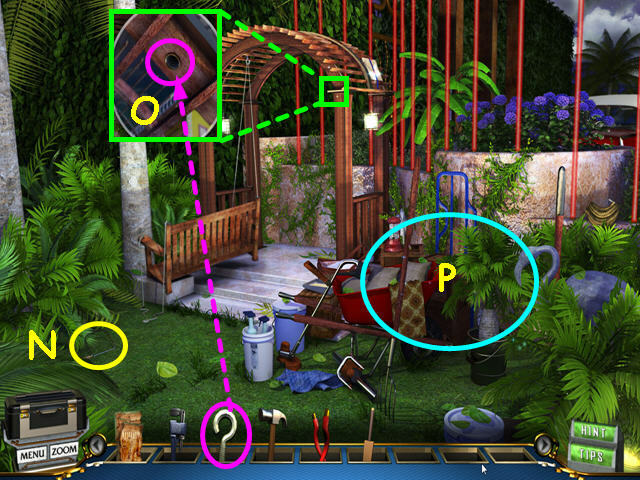 Select the wheelbarrow area for a Hidden Object Scene (P). Move the rug aside to find the horseshoe. You will earn the HOSE CLAMP and the SPRINKLER. Walk twice to the right. Place the CRICKET BAT on the saw horses (Q). Use the COPING SAW to cut the cricket bat (R). Gestures users will need to drag the saw up, then down. The CRICKET BAT HANDLE will go automatically into your inventory. Look at the close-up of the fountain (S). Place the SPRINKLER in the stem (T). Use the HAMMER on the sprinkler (U). Use the WRENCH to remove the SPRINKLER KEY (V). Walk left twice to return to the swing area. Look at the control on the swing frame (B). Place the CRICKET BAT HANDLE into the slot (C). Use the HOSE CLAMP at the base of the handle (D). Click on the handle to open the secret panel on the tree. Gestures users will need to drag the handle down to the left. Look at the close-up of the tree panel (E). Take the WIRE CUTTERS (F). 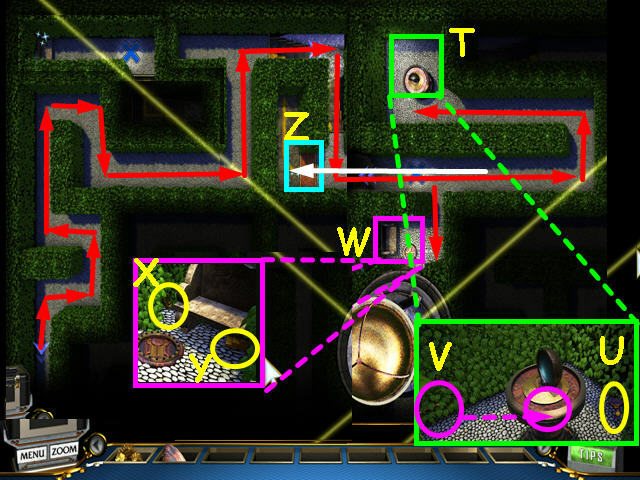 Take the 5 of 5 DIAGRAM for a mini-game (G). 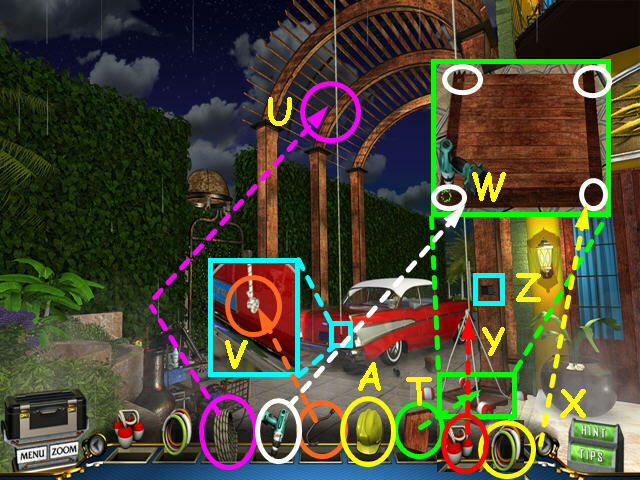 The object of this mini-game is to restore the diagram. Drag the pieces into place to reform the page. The pieces will lock together when properly placed. The scroll will go into your case, where you can refer to it at anytime. Use the SPRINKLER KEY on the lock (H). Click on the key to open the panel. Exit the close-up, then walk to the right. Look at the close-up of the camera mount (I). Use the WIRE CUTTERS to ship the 3 of 4 WIRES (J). Look at the top of the ladder and use the WIRE CUTTERS to snip the 4 of 4 WIRES (K). Return to the left and look at the tree panel. 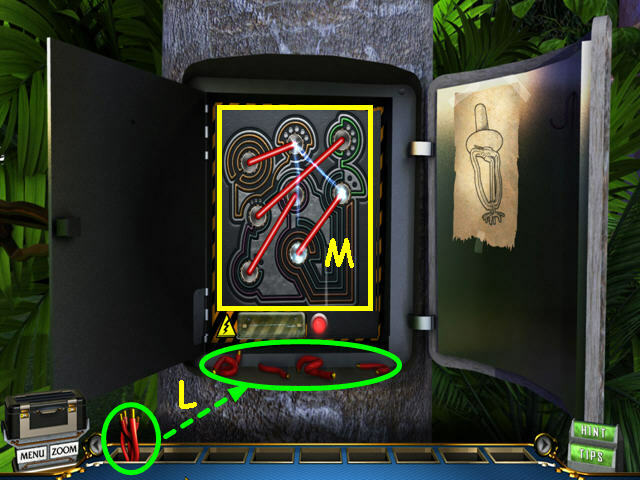 Use the WIRES on the panel to trigger a mini-game (L). Hover your mouse over each hole to see symbols. Click on two matching symbols to create a connection (M). Create a total of 4 connections. Walk to the right and look at the mini-game on the front gate. 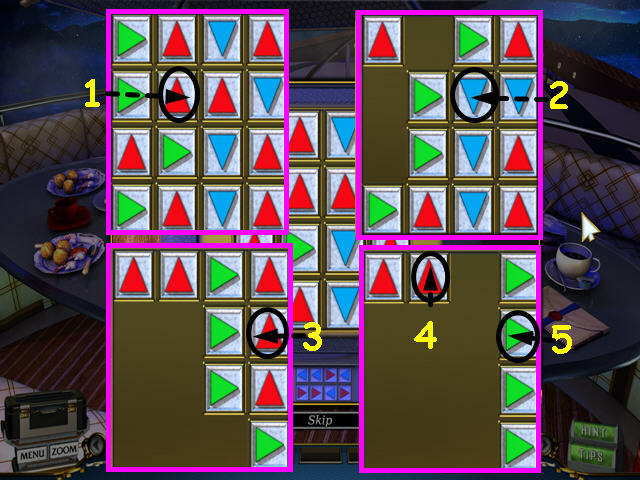 The object of this mini-game is to move all the blue triangles to the red positions. Triangles will turn green when correctly placed. 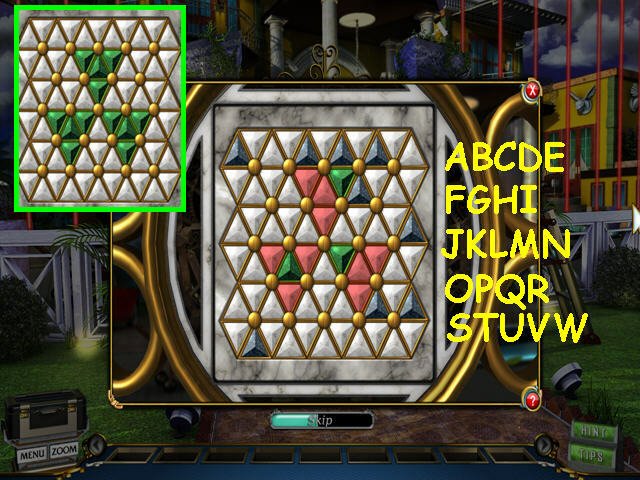 Rotate the 6 pieces surrounding each gold button. Click on the left half of the button to rotate counter-clockwise, and click on the right half to rotate clockwise. 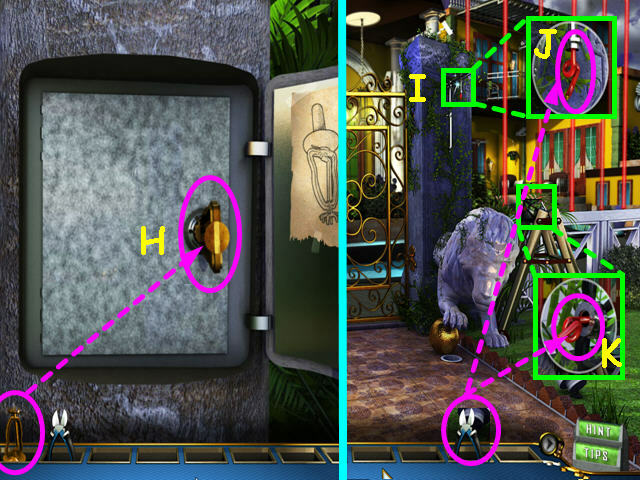 For this solution all moves will be clockwise- using the right half of the gold button. Letter the buttons alphabetically left to right, and top to bottom. 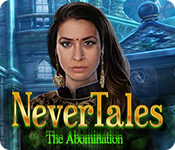 This mini-game is randomized, your solution may vary. Make the following moves: Ax3, Fx3, Jx1, Sx4, Tx1, Lx2, Vx2, Wx3, Vx4, Rx1, Nx3, Mx1, Ix3, Nx4, Cx2, Dx3, Hx5, Dx2. Note the back of the lounge chair (A). 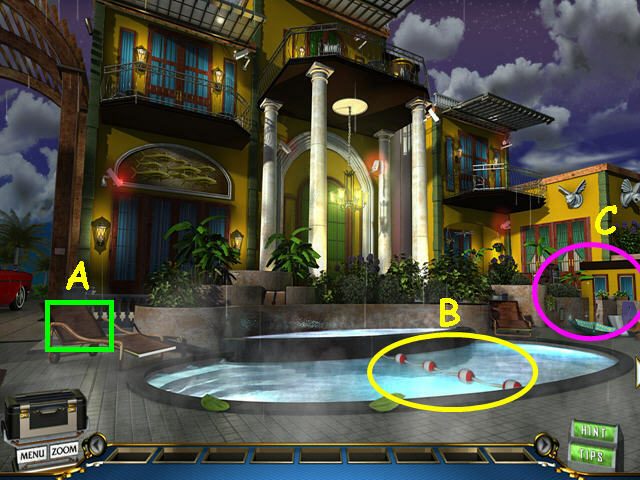 Take the POOL ROPE (B). 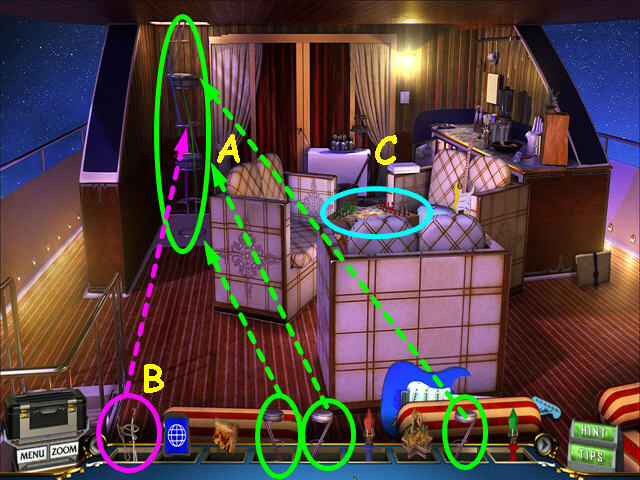 Select the area on the right for a Hidden Object Scene (C). You will earn the POOL RINGS. 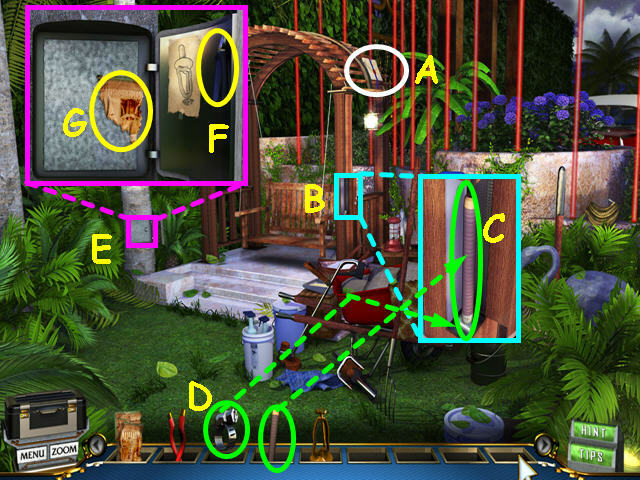 Take the Object of Interest- Hands of Gold from the potted plant (D). Note the passenger door on the car (G). 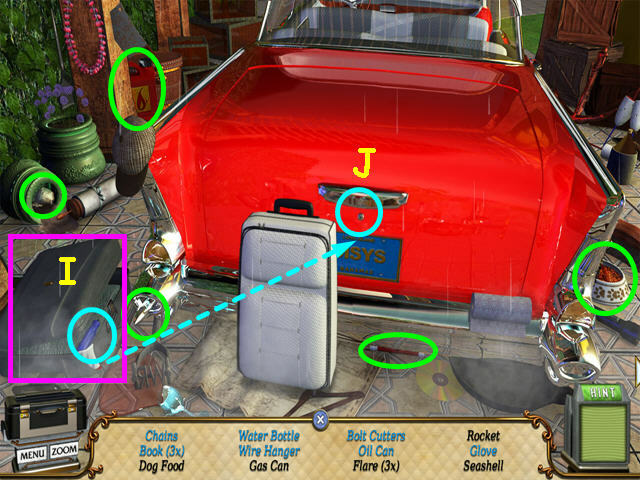 Select the trunk of the car for a Hidden Object Scene (H). Locate all the items not in blue on the list. Open the suitcase on the left (I). Take the screwdriver and use it on the trunk lock (J). Locate the remaining items on the list. 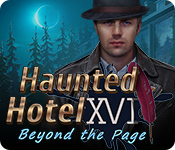 You will need to push the white suitcase back and forth to find all the items (K). You will earn the COAT HANGER. Look at the passenger door of the car. Use the COAT HANGER to unlock the door (L). You will need to drag the COAT HANGER down, then up if you are playing with gestures. Take the KEY CODE from the seat (M). Look at the close-up of the keypad (N). Use the KEY CODE on the keypad (O). 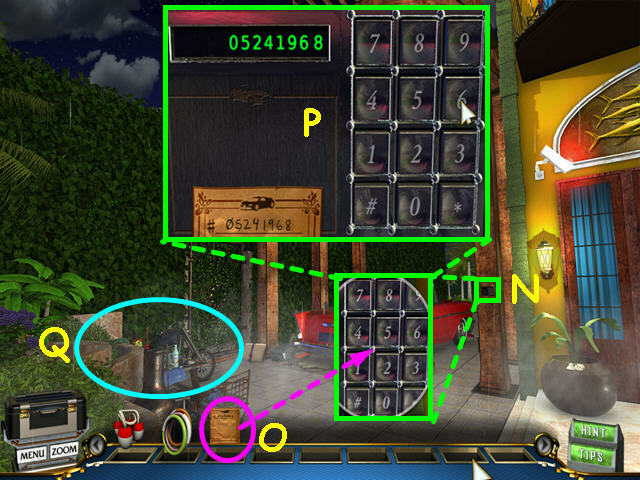 Press the numbers found on the key code (P). 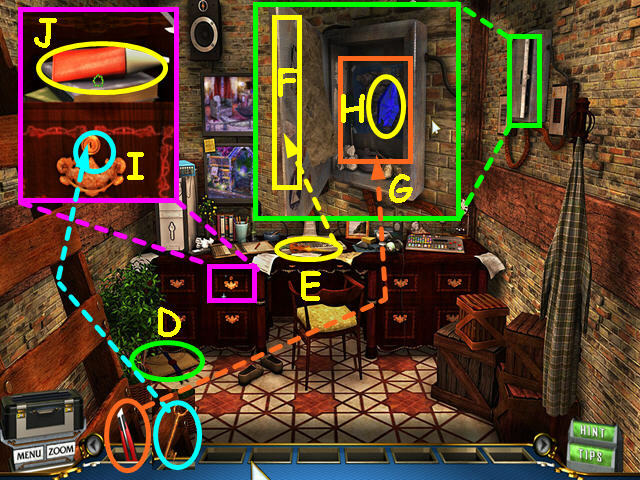 Select the area on the left for a Hidden Object Scene (Q). You will earn the ROPE, HOOK, DRILL, HARD HAT, and AXE. Walk down to the pool area. Use the AXE on the lounge chair (S). The CHAIR BACK will go automatically into your inventory. Place the CHAIR BACK on the floor under the key pad (T). Hang the ROPE from the arch (U). Look at the end of the rope and place the HOOK on the end (V). Look at the chair back on the floor and use the DRILL in each of the 4 corners (W). Use the POOL RINGS on the chair back (X). Use the POOL ROPE over the chair back (Y). Click on the key pad to test the lift (Z). Click on the HARD HAT to go up to the balcony (A). Use the ROPE on the glass covered table (D). Gestures users will need to drag the ROPE up to the fan. Move the plant aside (E). Turn on the fan switch (F). 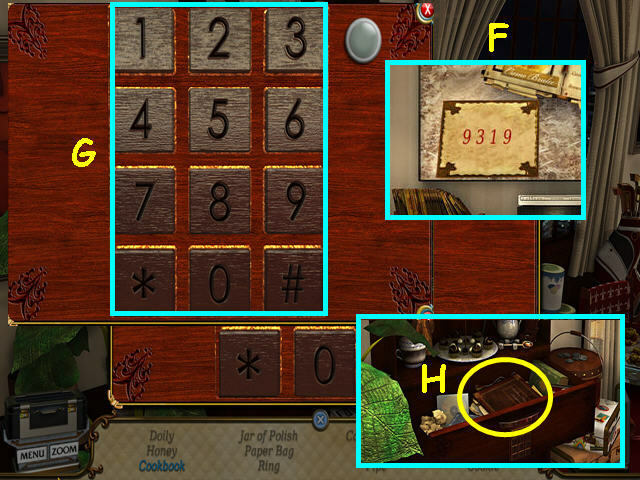 Select the table for a Hidden Object Scene (G). Move the cannon aside to find a key (H). Open the small box for the diamond (I). Move the cloth to find the Cryptex (J). Open the large box for the gavel (K). 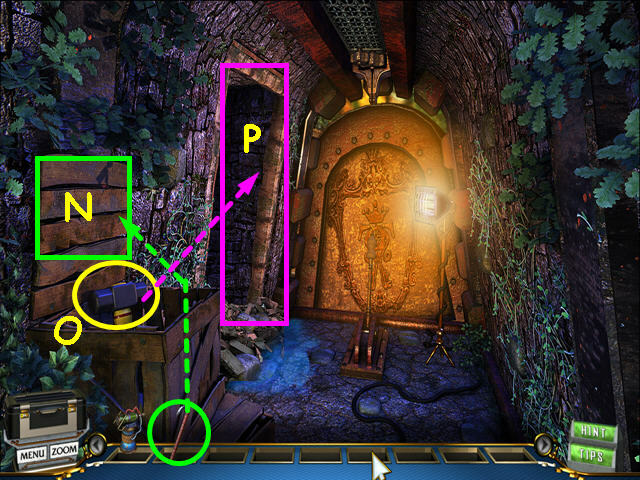 Use the chip on the device to learn how to lower the stairs (L). You will earn the GAVEL, CRYPTEX and DIAMOND. Walk forward to the bar. Move the bottle and take the COCKTAIL MIXER (O). Take the SURVEILLANCE PAD (P). Look in the wallet and note the serial number of the $100 bill- 4156579324 (Q). Look at the cutting board (R). Place the COCKTAIL MIXER on the cutting board (S). Use the GAVEL on the COCKTAIL MIXER (T). The LOCKPICK will go automatically into your inventory. Take the Object of Interest- Cleopatra’s Headdress (U). 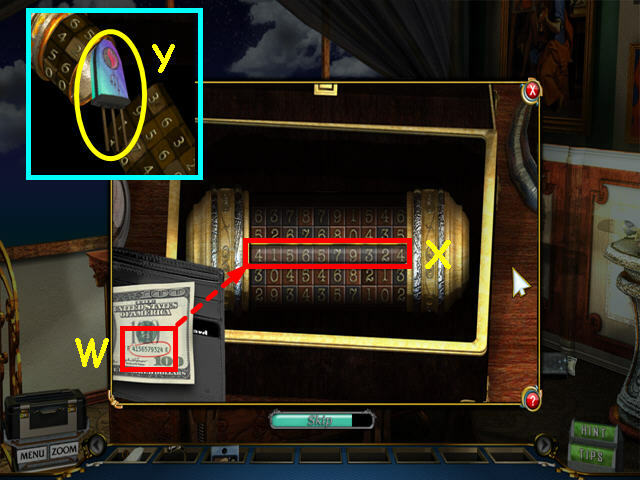 Look at the close-up of the box and place the CRYPTEX inside for a mini-game (V). 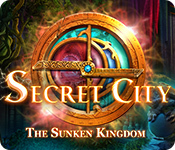 The object of this mini-game is to enter the correct code on the wheels of the cryptex. Click on each wheel to enter the serial number found on the $100 bill (W). Take the BYPASS CHIP that was inside (Y). Look at the SURVEILLANCE PAD from your inventory (A). Use the BYPASS CHIP under the left image (B). Exit the close-up of the SURVEILLANCE PAD. Look at the close-up of the lock on the gate (C). 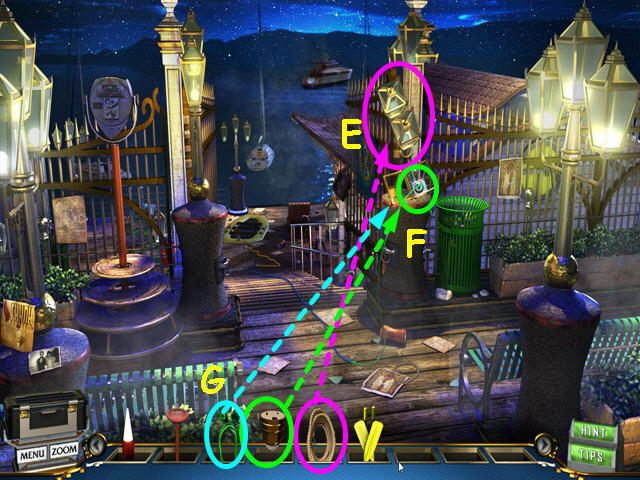 Use the LOCKPICK on the lock for a mini-game (D). 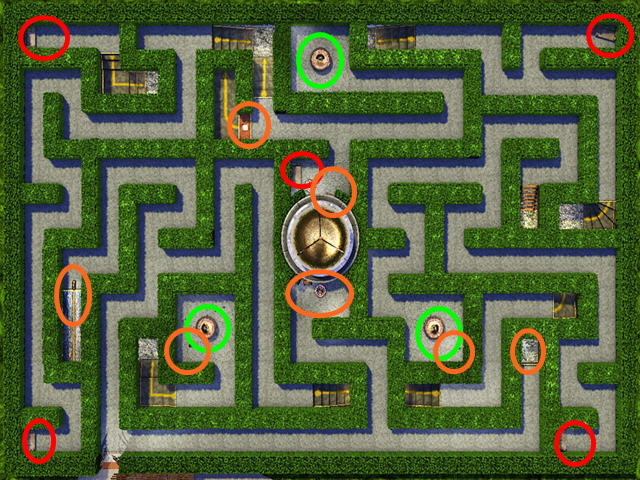 The object of this mini-game is to lock all the tumblers in the up position. Move you mouse left or right to position the lock-pick under a tumbler (E). Left-click when the tumbler bounces to the highest position (F). Repeat this step for the remaining tumblers. 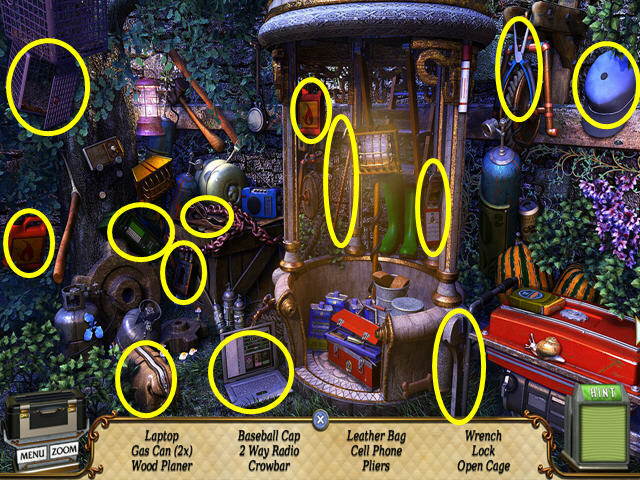 Select the gate area for a Hidden Object Scene. Move the hat to find a statue (G). 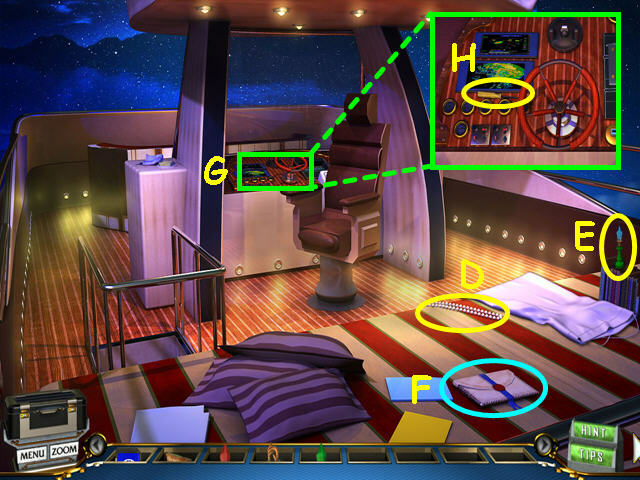 Open the 3 drawers to find other items (H). 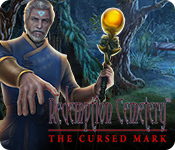 You will earn GENGHIS KAHN’S HORSE, BUDDHA STATUE, GENGHIS KAHN’S VASE, AZTEC TOTEM, and the AZTEC MEDICINE MAN. Look at each statue base to determine the placement of the statues. 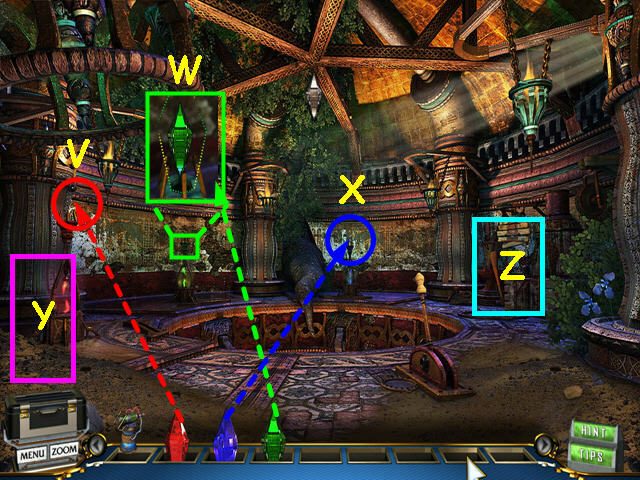 From left to right the statues are: GENGHIS KAHN’S HORSE (I), BUDDHA STATUE (J), GENGHIS KAHN’S VASE (K), AZTEC TOTEM (L), and the AZTEC MEDICINE MAN (M). Walk up the stairs (N). Take the INSTANT CAMERA (O). Open the grill and take the GRILLING FORK (P). Collect the 6 pillows and stack them on the chair (R). Look at the SURVEILLANCE PAD in your inventory (S). Use the INSTANT CAMERA on the right image to get a PICTURE (T). Look at the close-up of the security camera (U). Place the GRILLING FORK on top of the camera (V). Place the PICTURE at the end of the fork (W). Note the climbing wall (X). Use the TORCH to pry open the cooler (Y). Gestures uses will need to drag the torch downward. 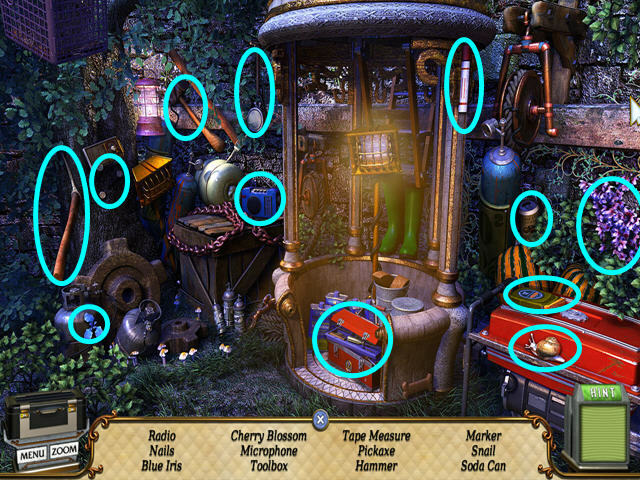 Select the cooler for a Hidden Object Scene. 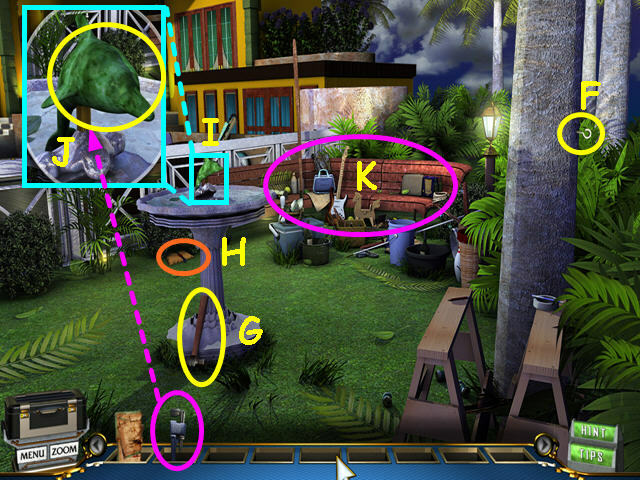 You will need to move the balloon, hat and beach ball to find some items (Z). You will earn the SUCTION FLAG, STEEL CONTAINER, CLIMBING PEGS, STRING, and FISHING REEL. Place the CLIMBING PEGS on the wall (A). Climb up the wall (B). Take the Object of Interest- Ship in a Bottle (D). Look at the close-up of the sparking wires (E). Use the STEEL CONTAINER on the wires to make the MAGNET CONTAINER (F). Look at the close-up of the skylight (G). Place the SUCTION FLAG on the glass dome (H). Use the STRING on the flag (I). Place the DIAMOND at the end of the string to cut a hole in the glass (J). Players using gestures will need to drag the DIAMOND in a clockwise circular motion. Place the FISHING REEL on the edge of the cut glass (K). Place the MAGNET CONTAINER next to the fishing reel (L). Click on the magnet container to trigger a mini-game. 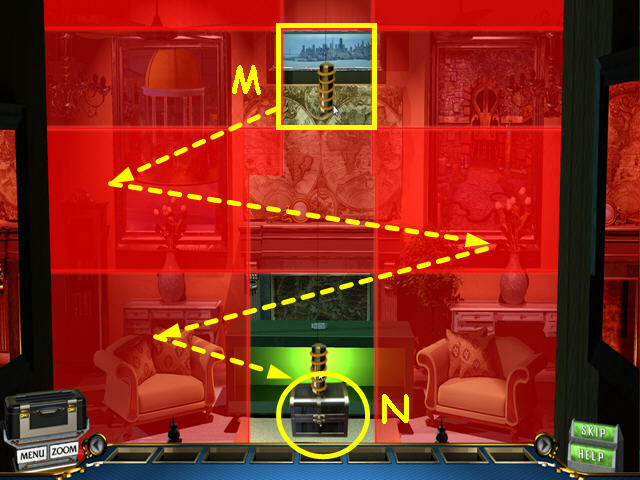 The object of this mini-game is to guide the magnet to the safe as the lasers move. Use your mouse to guide the magnet, making sure to keep it in the clear section (M). 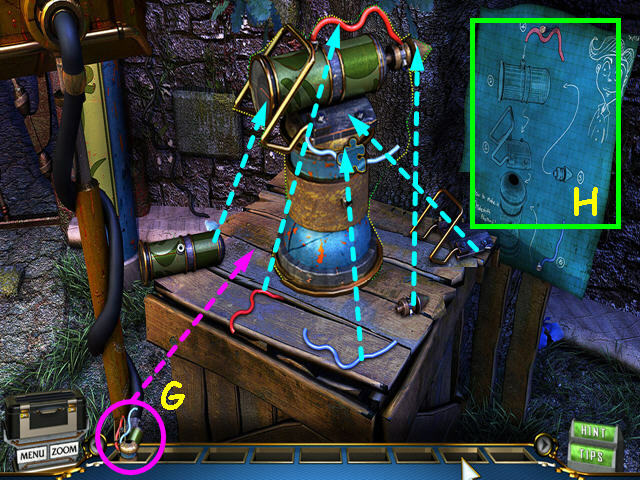 Guide the magnet to the bottom center to the safe and get the chest (N). Should you touch the red laser area before you attach to the chest, you will need to start over at the top. Once you retrieve the chest, avoid the lasers and return to the top. Should you touch the lasers now, you will need to start over at the safe area. Walk forward to Raven and he will escape. Note the caged entrance to the penthouse (A). 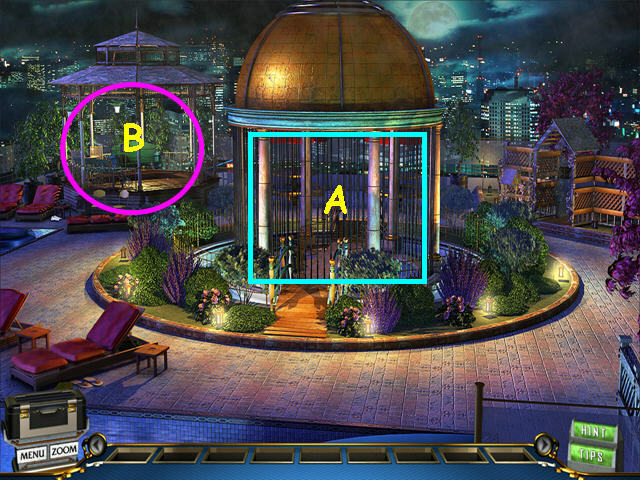 Select the gazebo for a Hidden Object Scene (B). 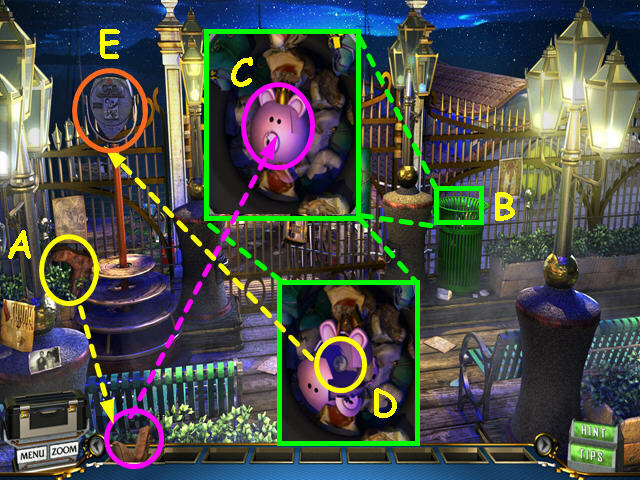 Move the beach ball to find a rose (C). 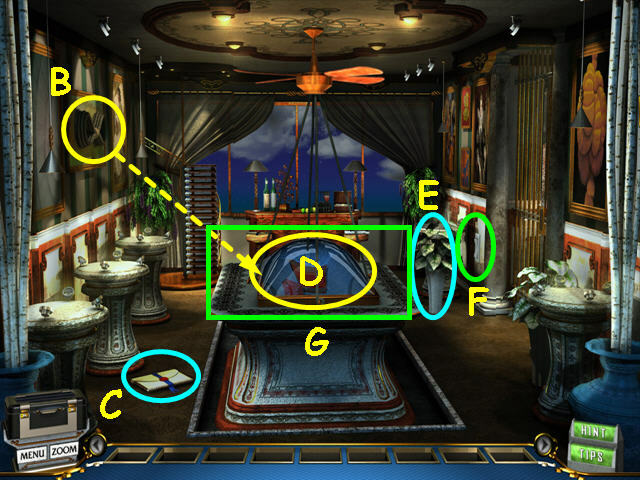 Move the vase to find the messenger bag (D). Knock down the pot to find the trowel (E). You will earn the GOGGLES. Walk right to the garden entrance. Take the 1 of 3 HOSE (G). Take the 2 of 3 HOSE (I). Walk down, then left to the pool area. Click on the GOGGLES in your inventory to put them on (K). Take the FLOWER PICKER from the pool (L). Lift the back of the lounger and take the 3 of 3 HOSE (M). Take the CUSHIONS from 2 loungers (N). Take the Object of Interest- Medieval Goblet (O). Read the dossier that was under the cushion of the lower lounger (P). Note the area next to the grate (Q). Open the grate and look inside (R). 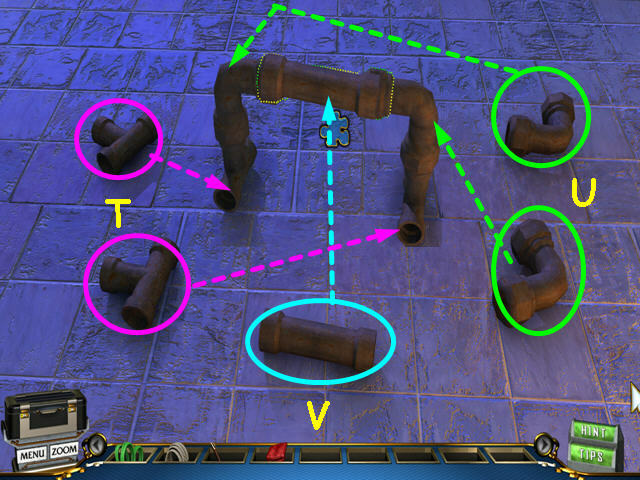 Use the WRENCH to collect 5 COPPER PIPE pieces (S). Click on each piece to take them. 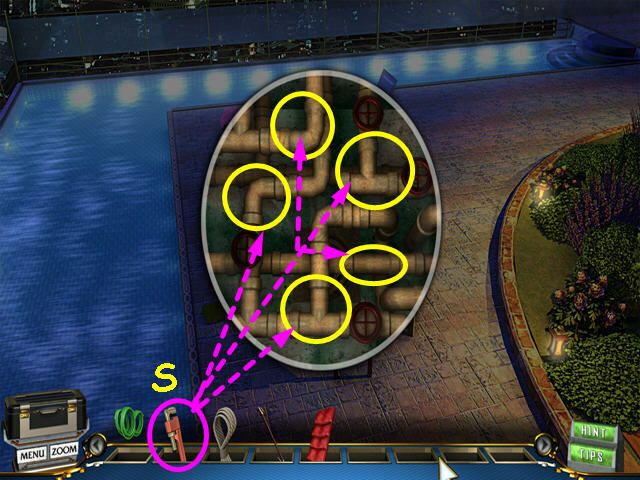 Gestures uses will need to drag the WRENCH horizontally or vertically at the ends of each pipe. Place the COPPER PIPES on the area just to the right of the grate. Place each pipe to make a lever support. Drag the ‘T’ pipes first to make the base (T). Place the elbow pipes on the ‘T’ pipes (U). Put the straight pipe in the center (V). Exit the close-up, then walk down. Walk to the gazebo in the upper left. Place the LEVER SUPPORT on the boards (W). 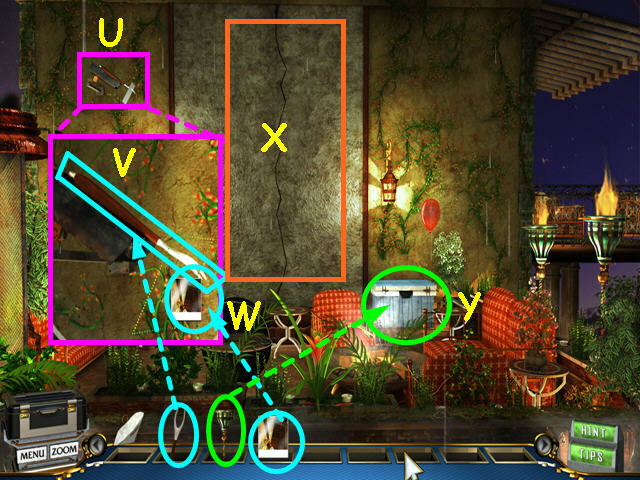 Place the FLOWER PICKER on the lever support (X). 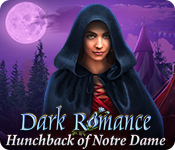 Players using gestures will need to drag the FLOWER PICKER in a downward motion. 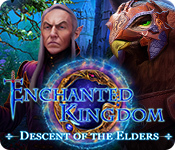 You will earn WOOD PLANKS. 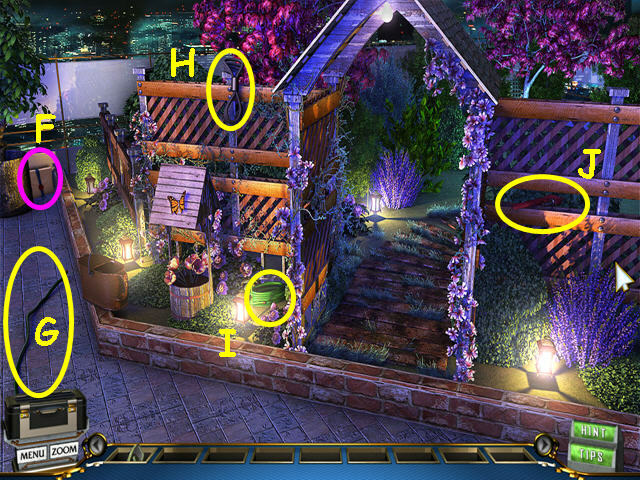 Select the area beneath the planks for a Hidden Object Scene (Y). 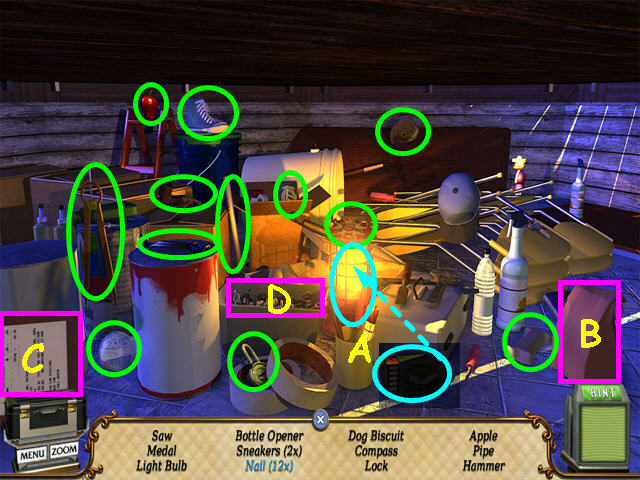 Click on the matchbox to get a lighted match, then use it to light the lantern (A). Move the bag to find the bone (B). Move the clipboard to find the bulb (C). 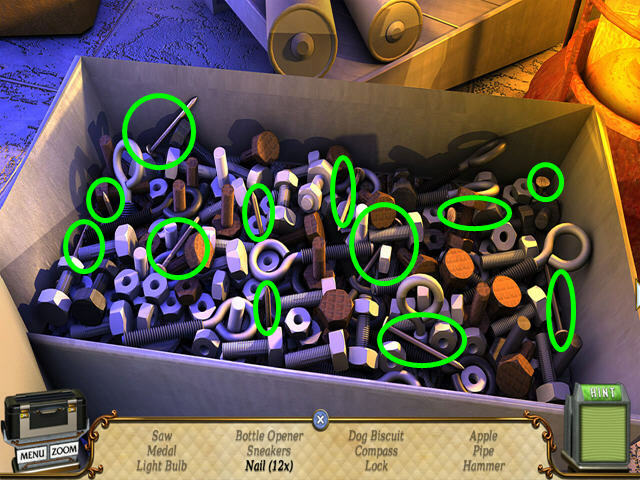 Locate all the items on the list except the 12 nails. Select the box for a close-up (D). You will earn the HAMMER and the NAILS. Walk down to exit the gazebo. Walk right, then enter the garden through the arch. Take the Object of Interest- Platinum Locket (E). Remove the lid and look in the garbage can (F). Take the SAW BLADE (G). You will automatically go to a close-up view. Use the SAW BLADE on the lowest plank to cut the rungs. Move the other two planks to make the sides of the ladder. Place the rungs on the planks (H). Use the NAILS on the rungs (I). Use the HAMMER on both ends of each rung (J). Place the LADDER against the dome (K). Tie the ROPE to the top of the dome (L). 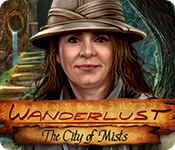 Walk right twice to the area with the statue. 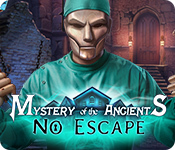 Take the rope from the ground and use it on the statue (M). 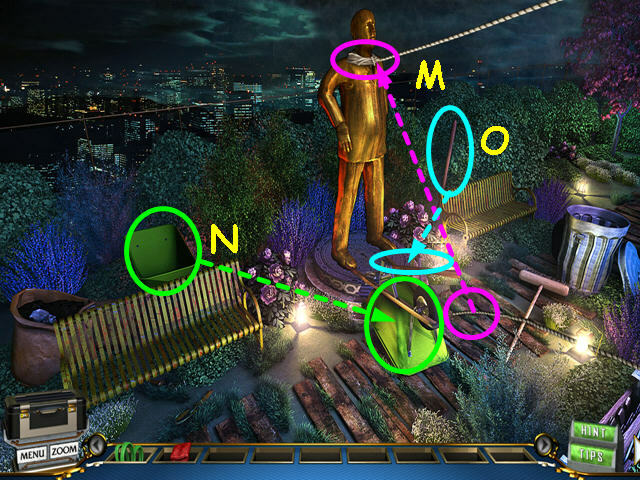 Take the wheelbarrow and use it at the base of the statue (N). Take the shovel and use it on the wheelbarrow to tip the statue (O). Gestures users will need to drag the end of the shovel down. Walk down twice to return to the dome area. Climb up the ladder and look in the hole. Throw the CUSHIONS down the hole (P). Tie the GARDEN HOSE at the top (Q). Note the china cabinet on the left (R). 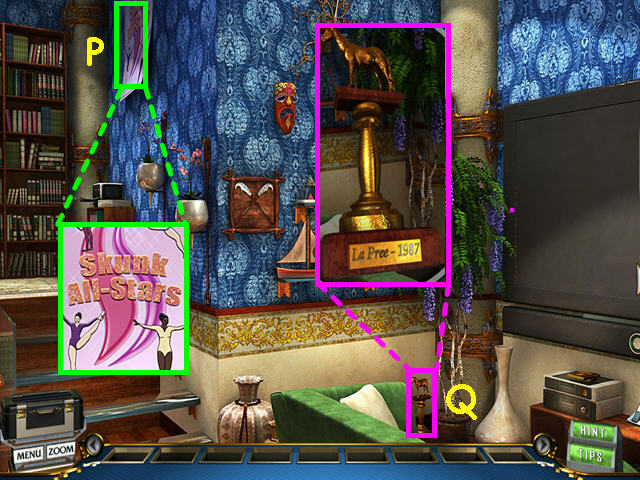 Move the pillow to find the Object of Interest- Faberge Egg (S). Walk right to the fireplace area (T). Make note of the lock on the bathroom door (U). 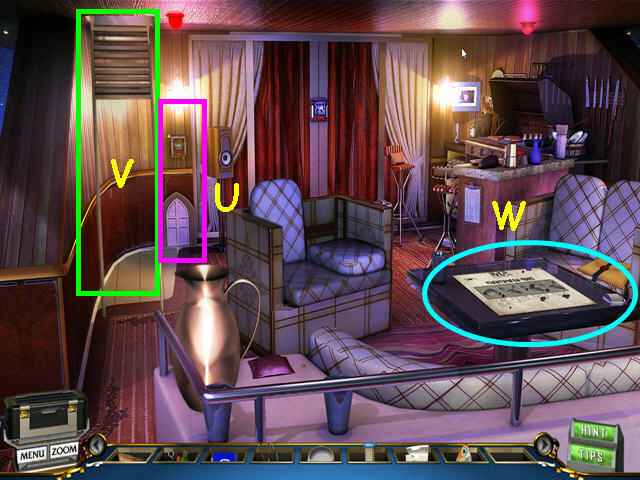 Select the coffee table for a Hidden Object Scene (W). Move the pillow to find a candy (X). Move the obelisk to find the USB drive (Y). You will earn the DVD. Place the DVD into the player (A). Click on the remote control (B). Press the ‘Play’ button (C). 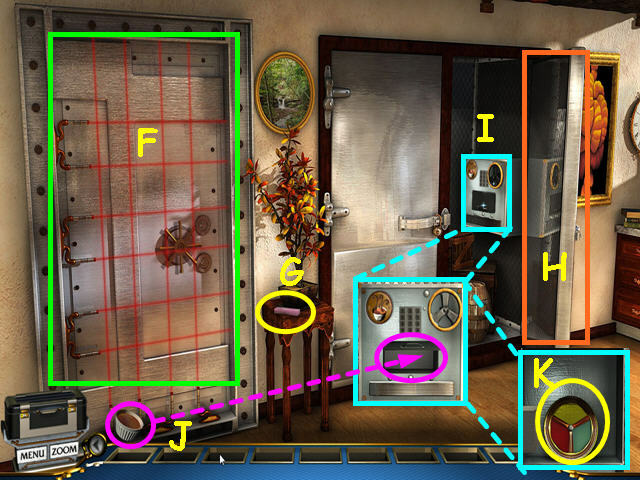 Watch the video to learn how to open the special safe, where the cookbook is located, and the code for the drawer (D). Note- this code is randomly generated- yours may differ. You can watch as many times as you like. Click on the remote to return it to the shelf. Walk down to return to the dining room. 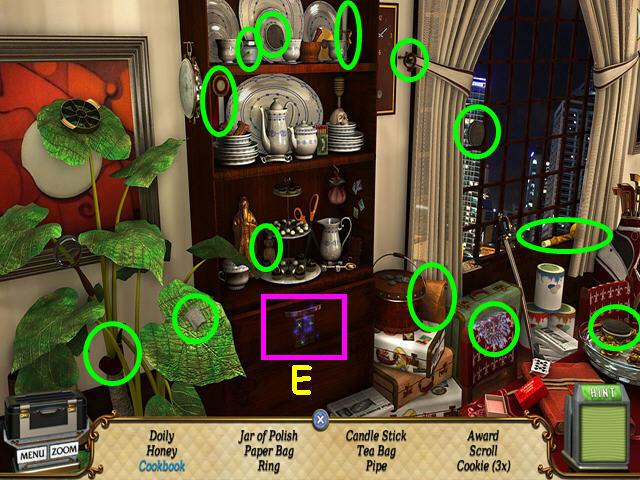 Select the china cabinet for a Hidden Object Scene. 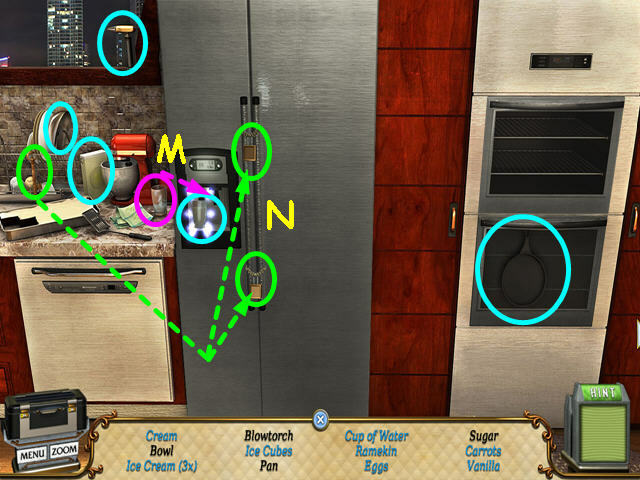 Locate all the items on the list except the cookbook. 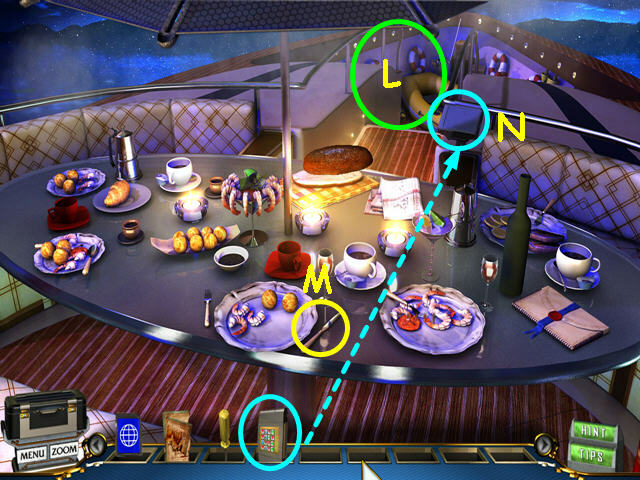 Look at the close-up of the drawer (E). Use the code from the video to open the drawer (F). Press the numbers on the keypad (G). Take the COOKBOOK from the drawer (H). 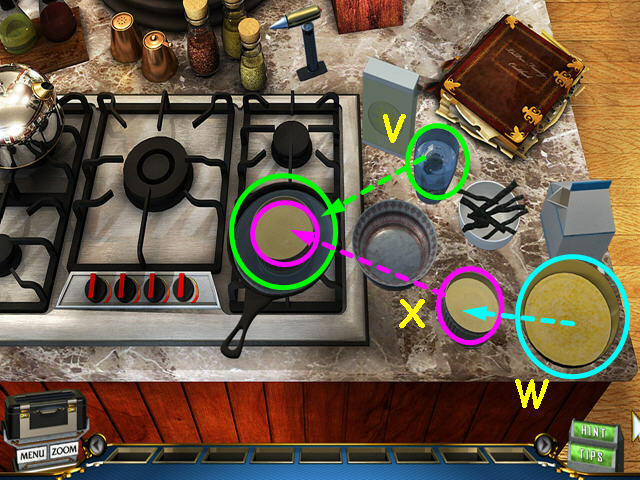 Look at the close-up of the stove area (J). Place the COOKBOOK on the counter (K). Click on the cookbook to read the instructions. 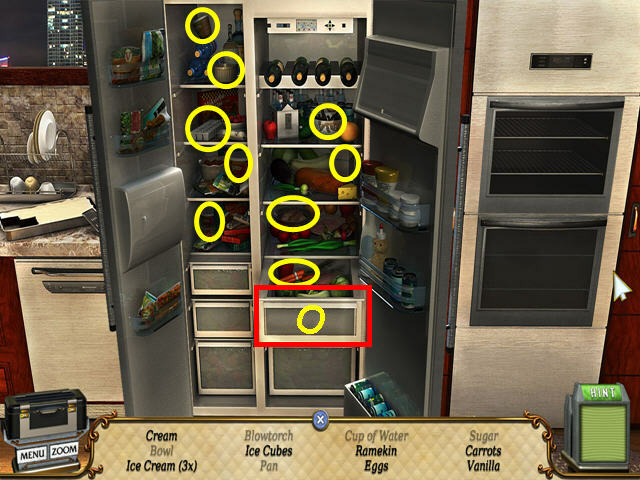 Exit the close-up and select the refrigerator for a Hidden Object Scene (L). 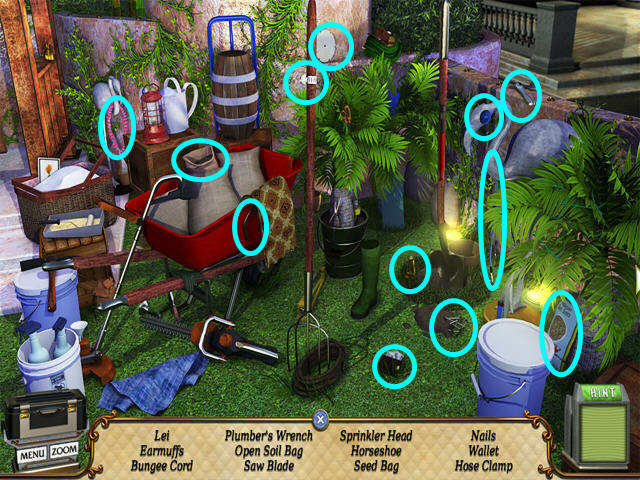 Locate the visible items on the list. Take the empty cup and place it in the dispenser to find the cup of water (M). Take the key and use it on the 2 padlocks (N). Click on the refrigerator doors to open them. Open the drawer to find the carrots (O). You will earn the INGREDIENTS. Look at the close-up of the stove area. Place the INGREDIENTS on the counter (P). Refer to the cookbook at anytime (Q). Click on the knob to turn on the stove (R). Place the cream and vanilla in the pan on the stove (S). Place the sugar and 6 eggs into the bowl (T). 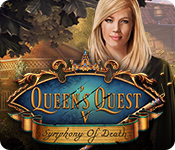 Players using gestures will need to drag the bowl in a circular clockwise direction. Take the pan from the stove and use it on the bowl (U). Place the water in the pan (V). Pour the bowl into the ramekin (W). Place the ramekin into the pan of water (X). The UNCOOKED DESSERT will go automatically into your inventory. Exit the close-up of the stove area. Look at the ovens (A). Open the door of the upper oven and place the UNCOOKED DESSERT inside (B). After it cooks and the oven door opens, take the BAKED DESSERT. Exit the close-up of the ovens. 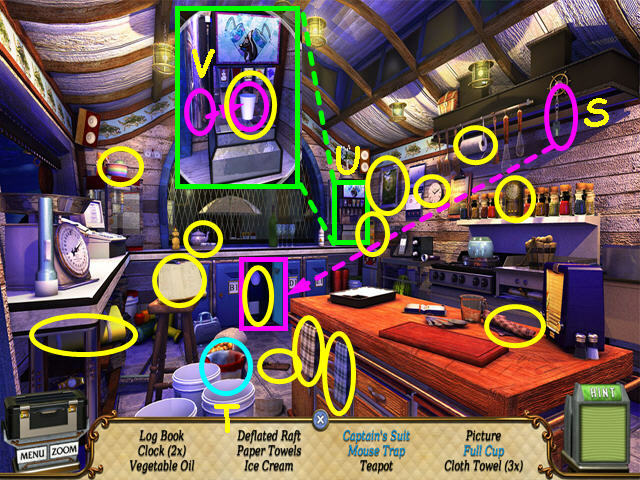 Look at the stove area (C). 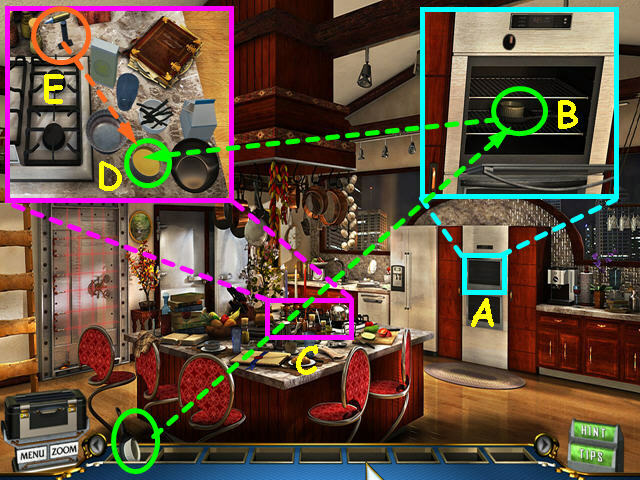 Place the BAKED DESSERT on the counter (D). Take the hand torch and use it on the dessert (E). Gestures users will need to drag the torch left and right. The FINISHED DESSERT will go automatically into your inventory. Exit the close-up and walk to the left. Take the BUBBLE GUM (G). Click on the pantry door to open it (H). Players using gestures will need to drag the door to the right. Look at the Smell-o-safe (I). 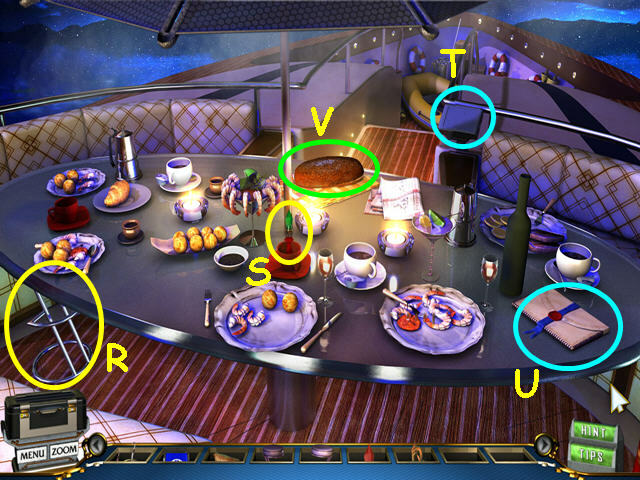 Place the FINISHED DESSERT in the slot (J). Take the DISC that is locked inside the Smell-o-safe (K). Walk down, then to the right twice. 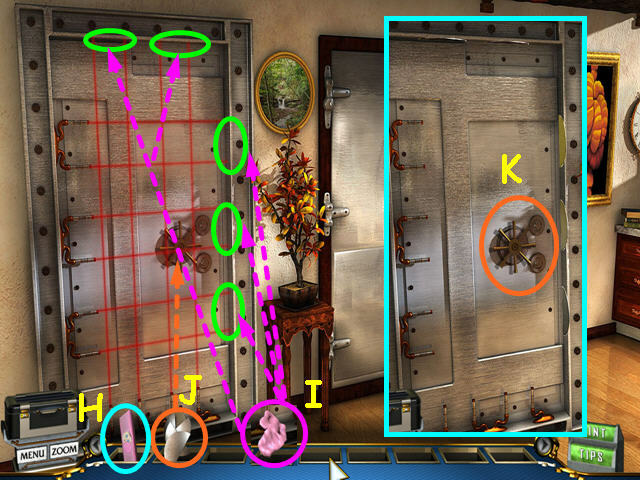 Look at the close-up of the bathroom door lock and use the DISC to activate a mini-game. The object of this mini-game is to rotate the inner and outer discs so that the colors match the outer edges (L). Clicking on the outer disc moves both discs, so move the outer disc so that the colors match the edges (M). Now, click on the inner disc so that all the colors match (N). Take the Object of Interest- Antique Earring (O). Take the DIAMOND DRILL BIT (P). 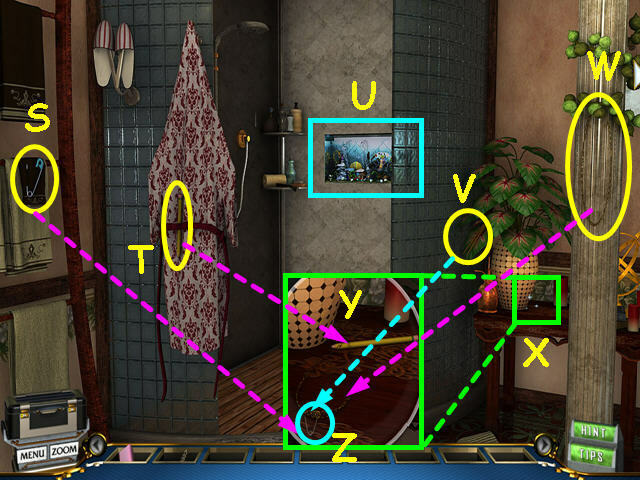 Note the sink area (Q). Walk to the shower area (R). Take the SAFETY PIN (S). Note the fish tank (U). Look at the close-up of the table (X). Place the PENCIL, then the CHAIN and SAFETY PIN on the table (Y). Use the TWEEZERS on the safety pin to make a hook (Z). Look at the fish tank for a mini-game. 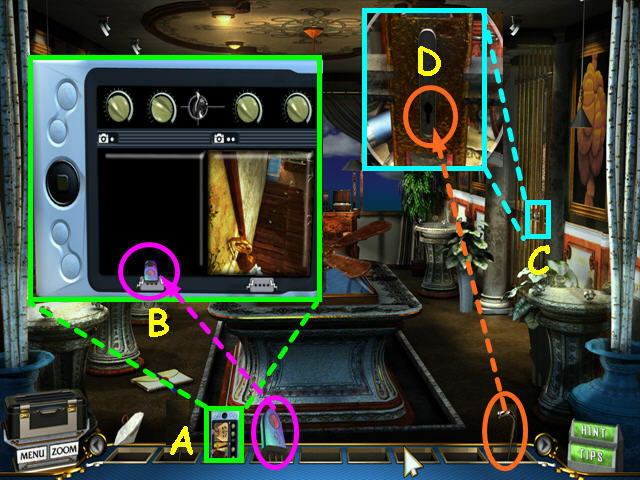 The object of this mini-game is to collect the 5 rubber-bands (A). 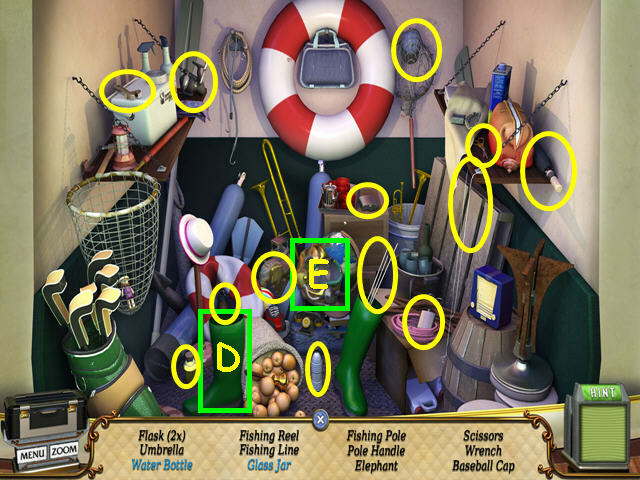 Use your mouse to move the hook (B). Hook a rubber-band and bring it to the top of the tank while avoiding the fish. Should a fish hit the hook area, the rubber-band will fall and you will have to try again. You will earn the RUBBER-BANDS. Exit the shower, then walk right to the sink area. 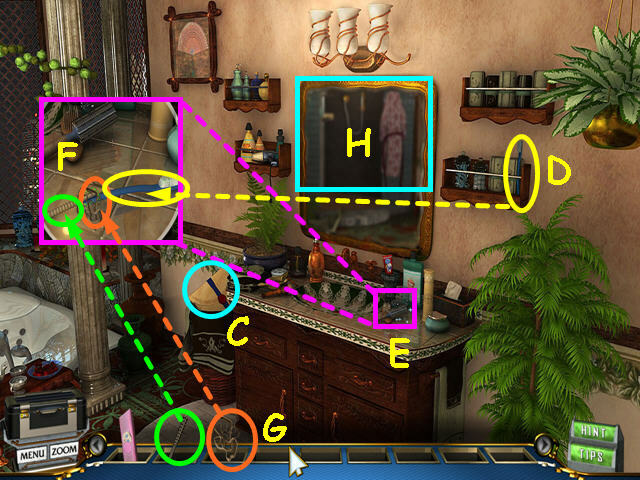 Look at the sink counter (E). Place the TOOTHBRUSH and DIAMOND DRILL BIT on the counter (F). Use the RUBBER-BANDS to secure the drill bit and make the GLASS CUTTER (G). Look at the mirror (H). Use the GLASS CUTTER on the mirror in 5 places. Gestures users will need to make semi-circles for each piece. Walk down 3 times to the dining area. Walk left twice to the safe. Select the BUBBLE GUM in your inventory to make BUBBLE GUM CHEWED (H). Use the BUBBLE GUM CHEWED on each pair of laser beams (I). Place the MIRRORS on the bubble gum (J). Click on the handle to open the door (K). 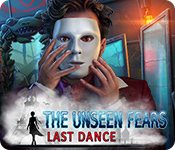 Players using gestures will need to make a counter-clockwise circle. Look at the bulletin board to learn that Ace Builders Group built the beach house (L). Look at the radio to learn Raven made a CD titled, Cool Jazz, Hot Coffee (M). Note the bar area on the left (N). Walk right to the sofa (O). Look at the poster on the wall of the Skunk All Stars gymnasts (P). Look at the horse trophy from 1987 (Q). 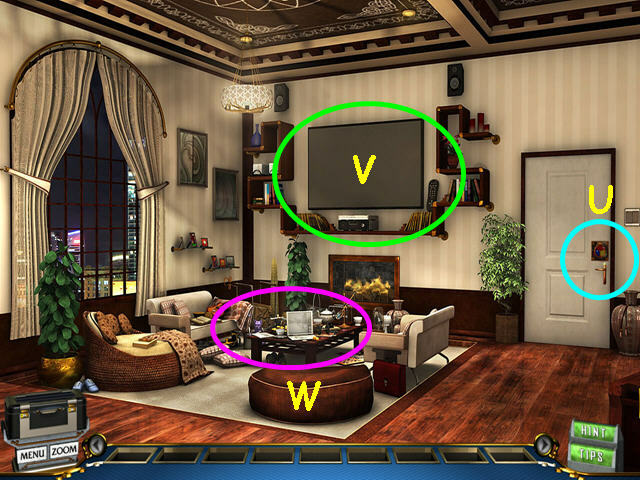 Select the bar area on the left for a Hidden Object Scene. 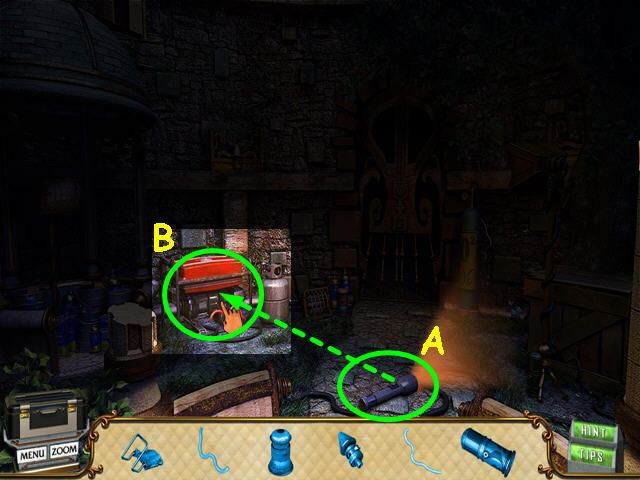 Open the chest to find the water bottle (R). Gestures users will need to drag the lid up. Open the cabinet door to find the shoe (S). Move the towel to find a bottle cap (T). You will earn the UTILITY KNIFE. Move the carpet to the left to find the trap door (V). 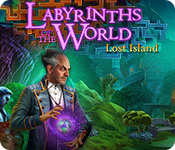 Players using gestures will need to drag the carpet to the left. Use the UTILITY KNIFE on the box (W). Gestures users drag the UTILITY KNIFE to the right. Look in the box and take the CD (X). Look at the La Moufette champagne bottle (Y). 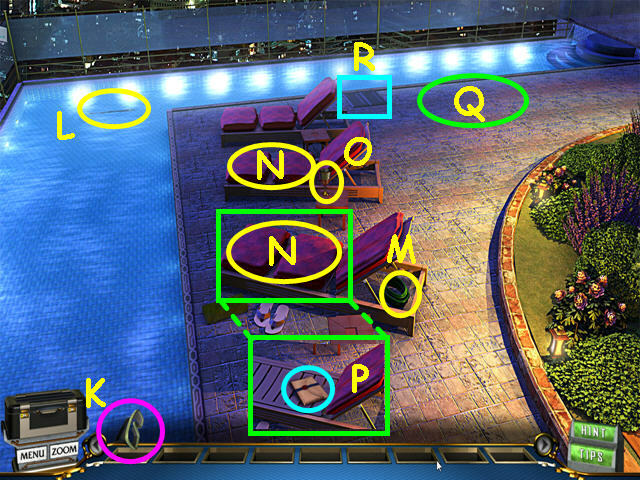 Select the desk area (Z). 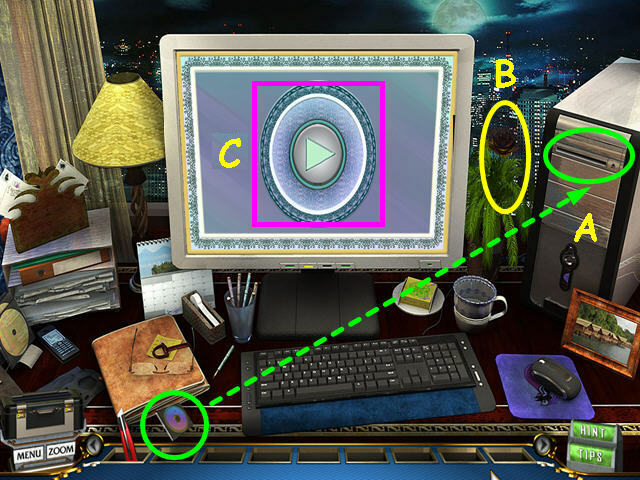 Place the CD into the computer (A). Take the Object of Interest- Crystal Rose (B). Press the Play arrow on the monitor screen (C). 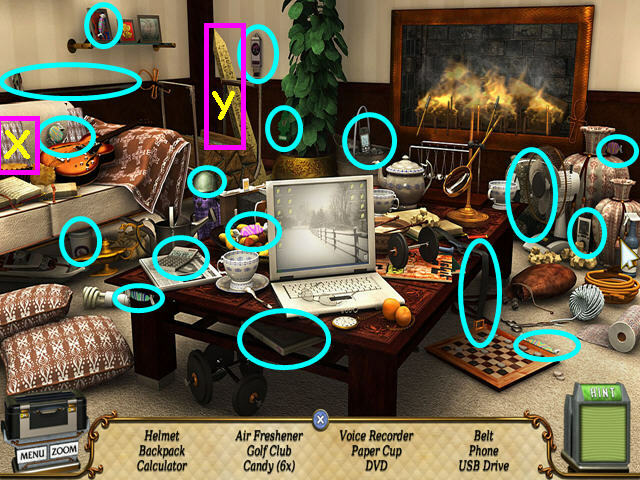 You will need to answer 5 questions based on the items found in this room. Should you choose incorrectly, you will need to re-start the quiz. Gestures users will need to drag the door to the right in a semi-circle. Take the LETTER OPENER (E). Look at the power supply box and use the LETTER OPENER to pry open the door (F). Use the UTILITY KNIFE to cut the false back away (G). Take the Sapphire Phi Crystal (H). Take the DRAWER KEY that is behind the crystal. Exit the close-up of the power box. Use the DRAWER KEY to unlock the drawer (I). Take the SUPER GLUE (J). Look into the power supply box (K). Use the SUPER GLUE on the KNOB (L). Players using gestures will need to drag the SUPER GLUE down. Look at the close-up of the right side of the desk (M). Take the GOLF TEE and place it into the control panel (N). Place the KNOB on the golf tee (O). Gestures users will need to drag the KNOB in a clockwise circle. 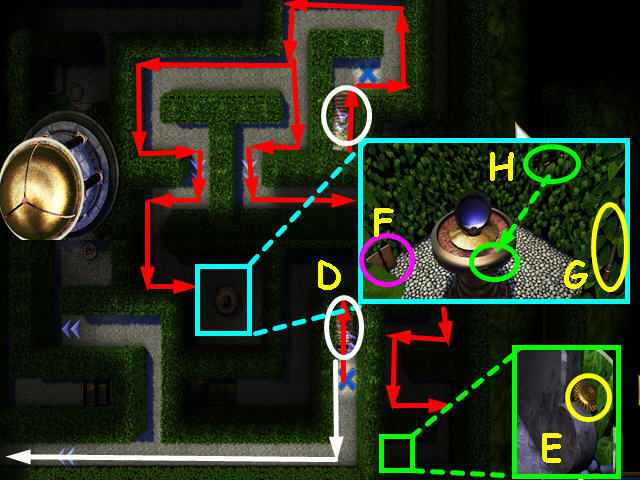 This is an overhead view of the complete maze to assist you with orientation. 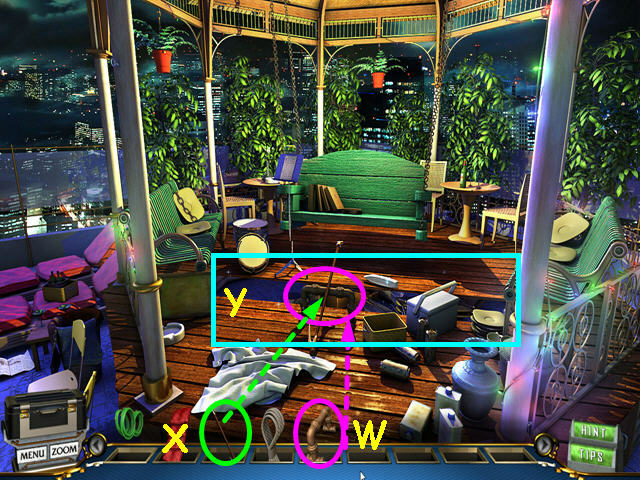 The 3 mirrors are circled in green. 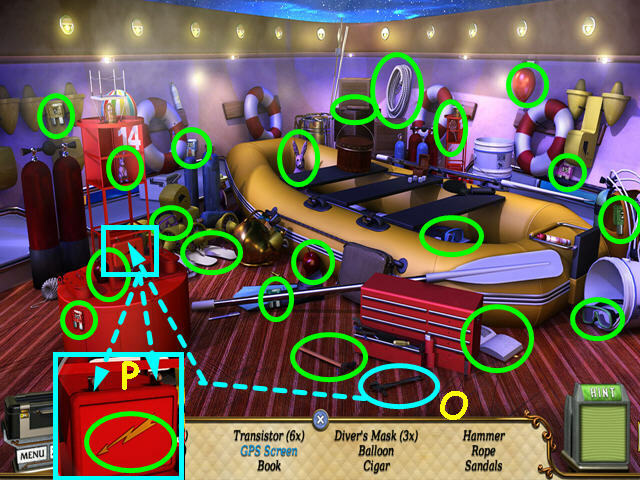 The gear locations are circled in red. Locations with other items are marked in orange. 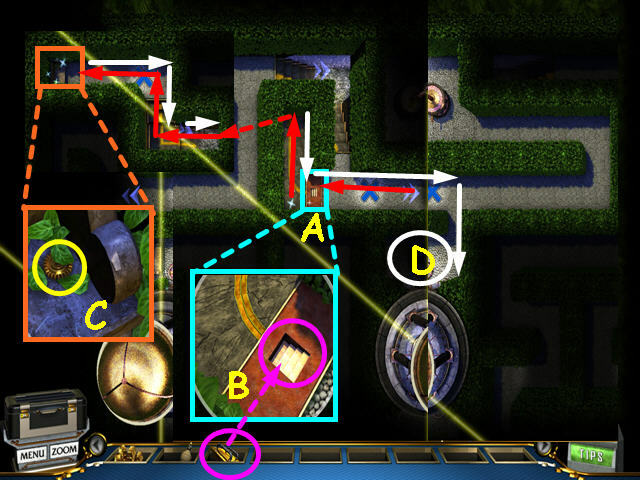 Click on the arrows to move through the maze. Follow the path of the solid red arrow to the dome. Follow the path of the dashed red arrow. Place the LADDER in the hole (C). 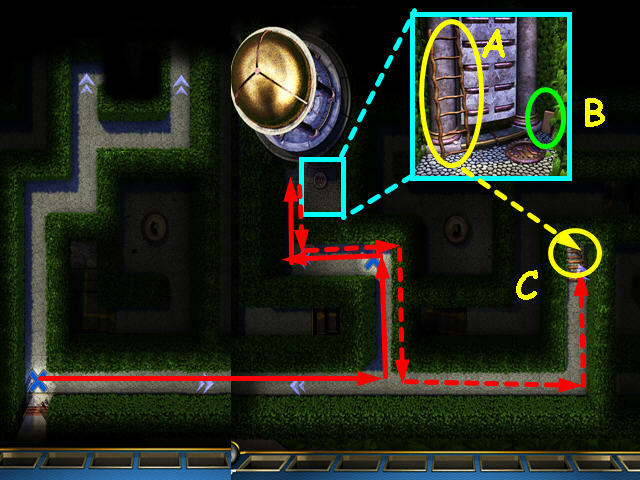 Use the ladder to get to another part of the maze (D). Follow the solid red arrows to 2 locations. 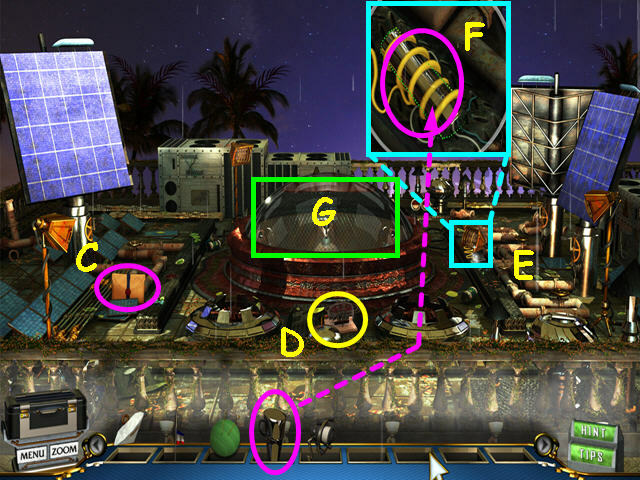 Take the 1 of 5 GEAR from the lower right location (E). When you are at the center location, read the dossier (F). Take the STAIR LEVER (G). Take the handle from the bushes and use it on the mirror (H). Return to the ladders and follow the white arrow. Place the STAIR LEVER on the mechanism to open the stairs (I). Gestures users will need to pull the lever in a downward motion. Walk down the stairs to come up in another section of the maze (J). Look at the close-up of the mirror (K). 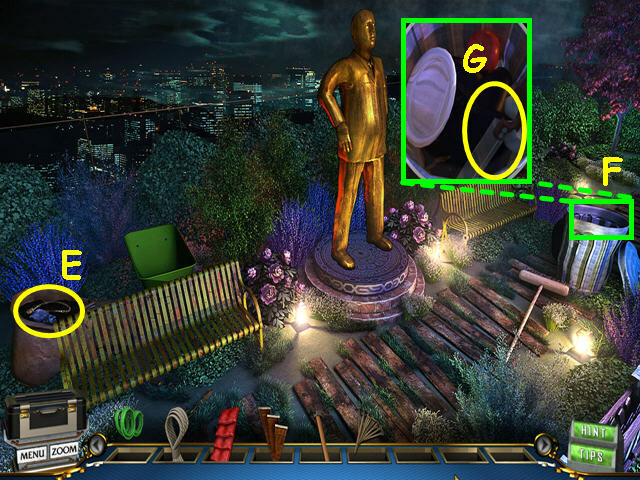 Take the GAZEBO DISC (L). Take the handle from the bushes and use it on the mirror (M). Gestures users need to drag the handle to the left. Follow the red arrows to a stairway (N). Continue on and take another stairway (O). Look at the close-up and take the 2 of 5 GEAR (P). Follow the white arrows to another set of stairs (Q). Look at the close-up of the corner and take the 3 of 5 GEAR (R). Retrace your steps back to the stairs, then follow the white arrows (S). 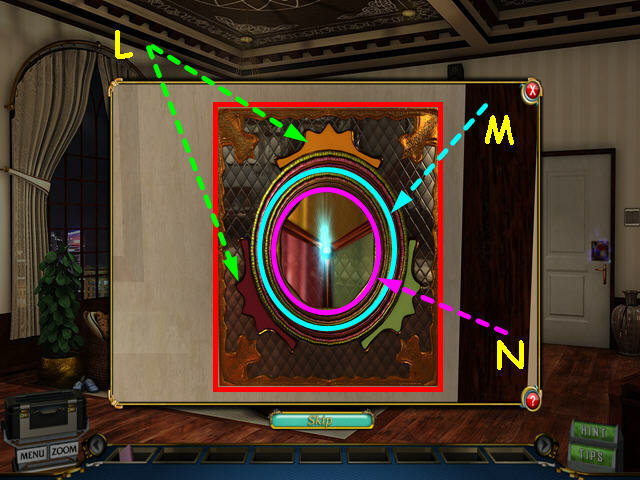 Look at the close-up of the upper mirror (T). Take the Object of Interest- Eau de Toilette (U). Take the handle from the bushes and use it on the mirror (V). Gestures users will need to drag the handle to the left. Look at the close-up near the dome (W). Take the 4 of 5 gear (X). Take the STAIR KEY (Y). Follow the white arrow to the locked stairs (Z). 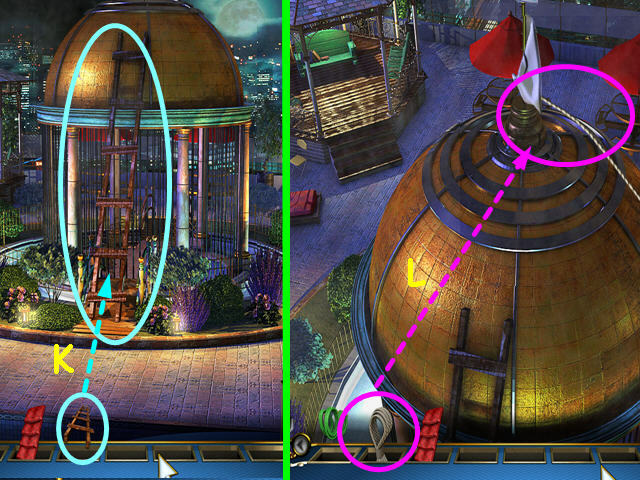 Look at the close-up of the locked stairs (A). Use the STAIR KEY on the lock (B). Look at the close-up of the corner and take the 5 of 5 GEAR (C). Follow the white arrows back, then look at the area by the dome (D). 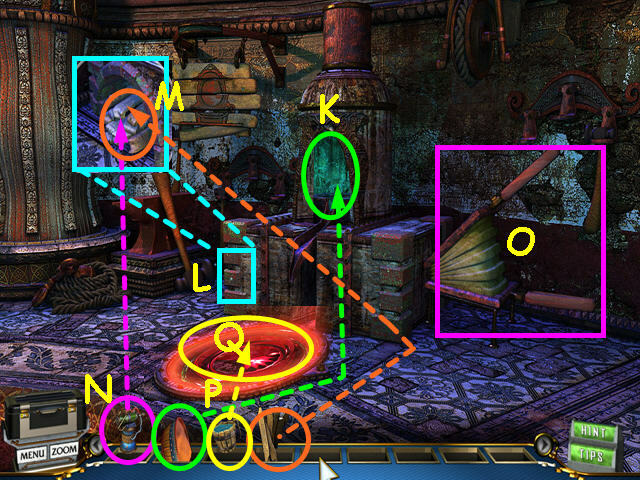 Place the GEARS on the mechanism (E). Enter the floor chamber (F). This will take you to the other side of the dome. Climb up the ladder (G). Take the Object of Interest- Aztec Hoops (H). 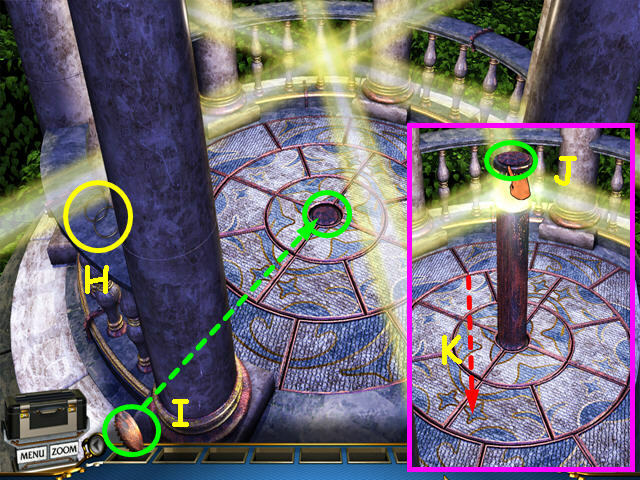 Place the GAZEBO DISC in the center of the floor (I). Press the disc once it rises from the floor (J). Walk down the stairs that appear under the disc (K). 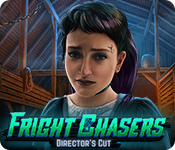 Look at the generator for a mini-game (B). 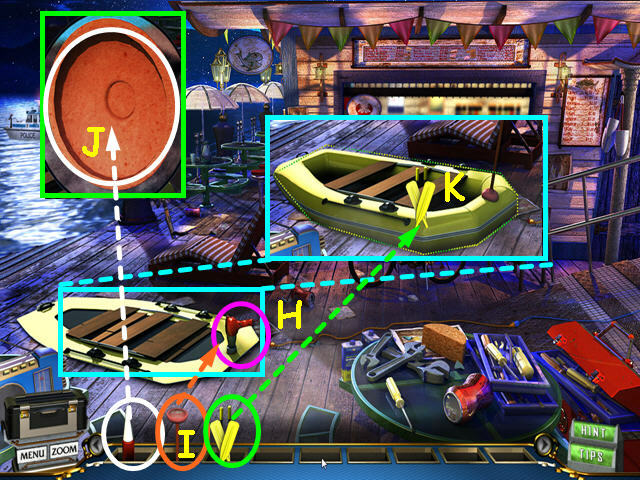 The object of this mini-game is to press the button 3 times when the red ball is in the green area (C). There are 3 lights to indicate your progress (D). Press the blue button 3 times while the red ball is in the green area (E). Place the LOOSE PARTS on the crate (G). Use the Diagram to assemble the parts (H). Drag each part into position- some may need to be placed before others. You will make the EMPTY BLOW TORCH. Look at the close-up of the fuel tank gauge (I). Use the EMPTY BLOW TORCH on the gauge (J). Use the FULL BLOW TORCH on the gate (K). Look at the fuel tank gauge and refill the EMPTY BLOW TORCH. 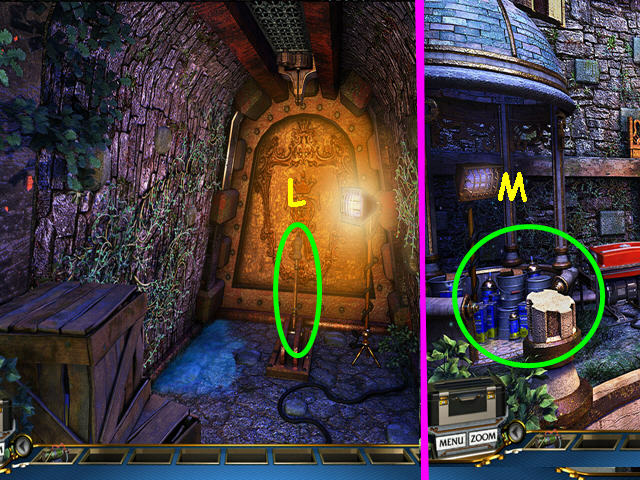 Select the area on the left for a Hidden Object Scene (M). You will earn the CROWBAR. Use the CROWBAR on the top of the crate (N). Gestures users will need to drag the CROWBAR downward. Use the SLEDGEHAMMER on the left wall several times (P). 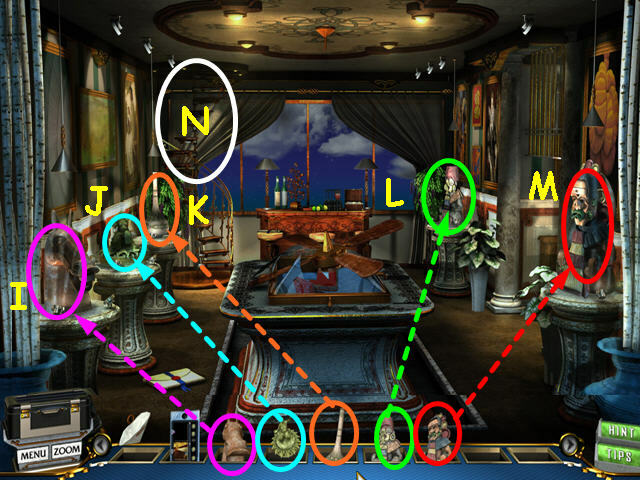 Select the paintings on the floor for a Hidden Object Scene. 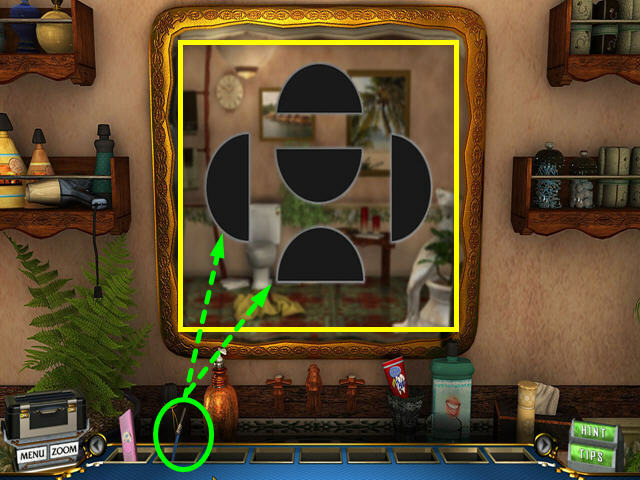 Move the painting to find the pearl necklace (Q). 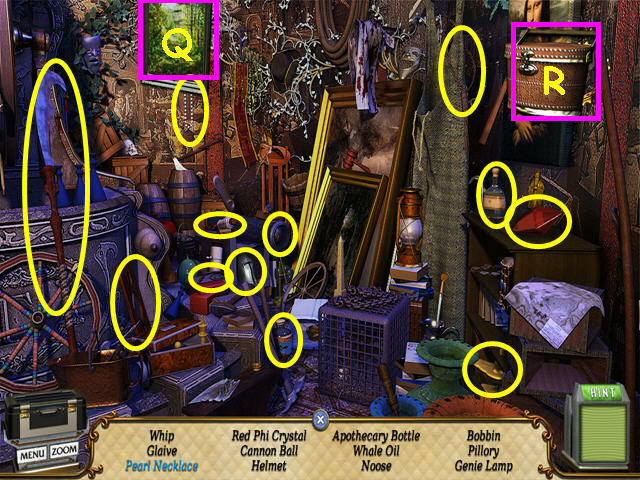 Move the case to find the Red Phi Crystal (R). 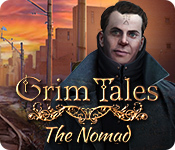 You will earn the WHALE OIL. Read the elephant diagram (S). Take the 4 SCOOPS and place them on the wheel (T). Use the WHALE OIL in three places (U). 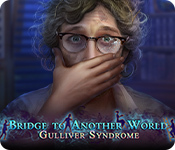 Players using gestures will need to drag the WHALE oil to the left. Walk down, re-pull the lever, then walk forward. Gestures users will need to drag the lever down. Click on the diagram to put it away. Place each of the 3 CRYSTALS into the matching stand. From left to right, they are the RUBY PHI CRYSTAL (V), the EMERALD PHI CRYSTAL (W), and the SAPPHIRE PHI CRYSTAL (X). Note the stream of sand (Y). 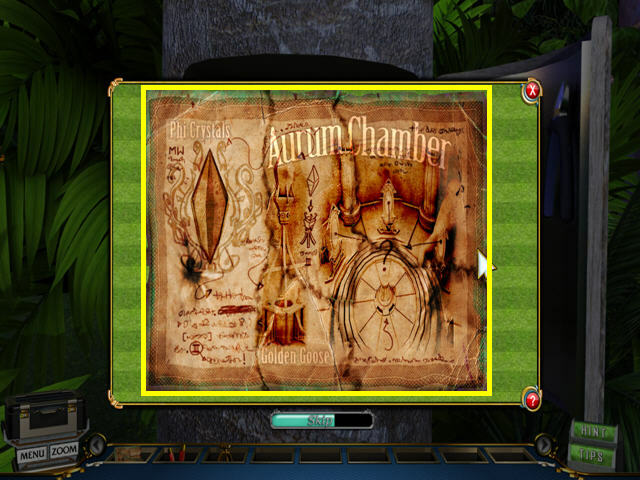 Enter the chamber on the right (Z). Take the bellows and move it to the right (A). Place the BOWL in the stream of sand (D). The BOWL of SAND will go automatically into your inventory. Use the CHISEL on the Mona Lisa (E). 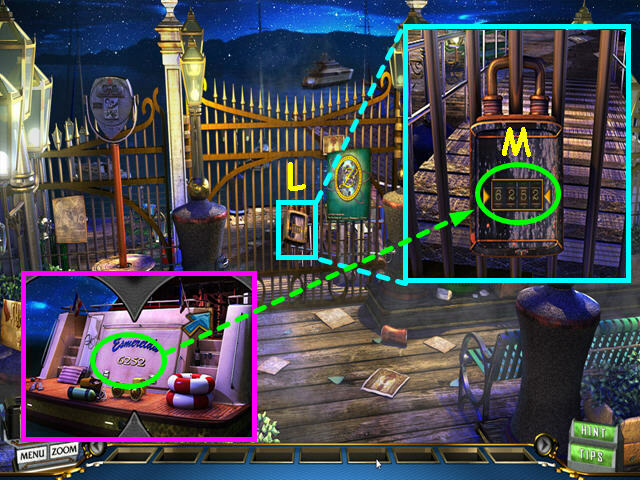 Look behind the Mona Lisa and take the Object of Interest- Egyptian Vessel (F). 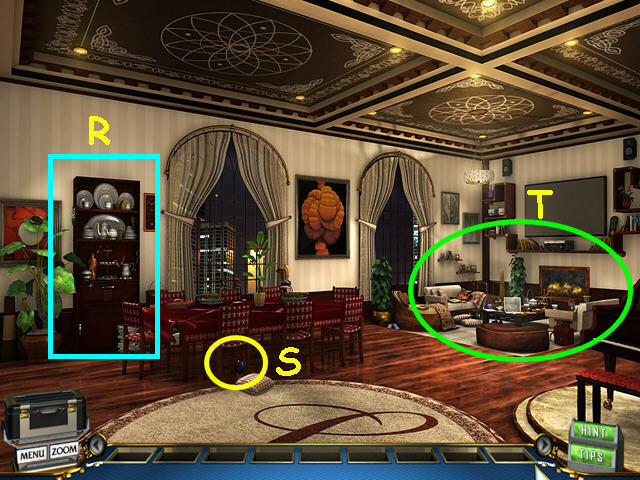 Select the paintings on the floor for a Hidden Object Scene (H). You will earn the BUCKET EMPTY. Use the BUCKET on the water to get the BUCKET FULL. 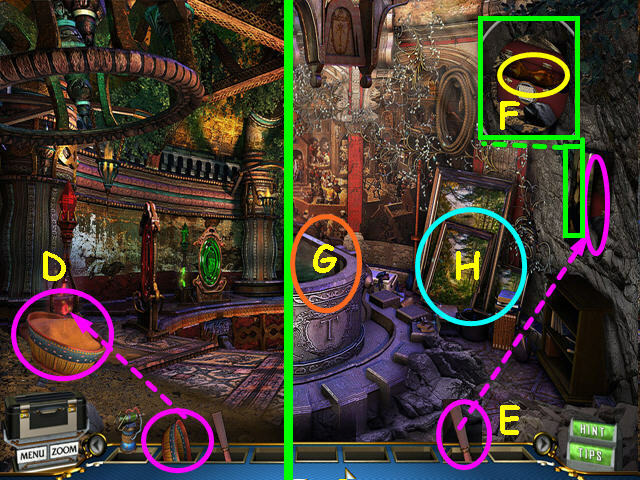 Select the area on the left for a Hidden Object Scene. You will earn the PICKAXE. Use the PICKAXE on the crate (I). Take the SCRAP WOOD (J). Walk forward 3 times to the furnace. Use the BOWL of SAND in the furnace (K). Look at the close-up of the stove (L). Place the SCRAP WOOD in the stove (M). Use the FULL BLOW TORCH to light the wood (N). Pump the bellows twice (O). Gestures users will need to drag the bellows handle down twice. Pour the BUCKET FULL on the disc (P). Take the NEW LENS (Q). Walk down to exit the furnace area. Place the NEW LENS in the stand (R). Take the Elephant and place it in the stand (S). Congratulations! 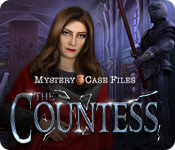 You have completed Intrigue Inc.: Raven’s Flight!